Rattans are climbing palms whose bare stem is used in the construction of cane furniture and mats. It is a vine that grows in tropical forests and is used primarily in the furniture industry. 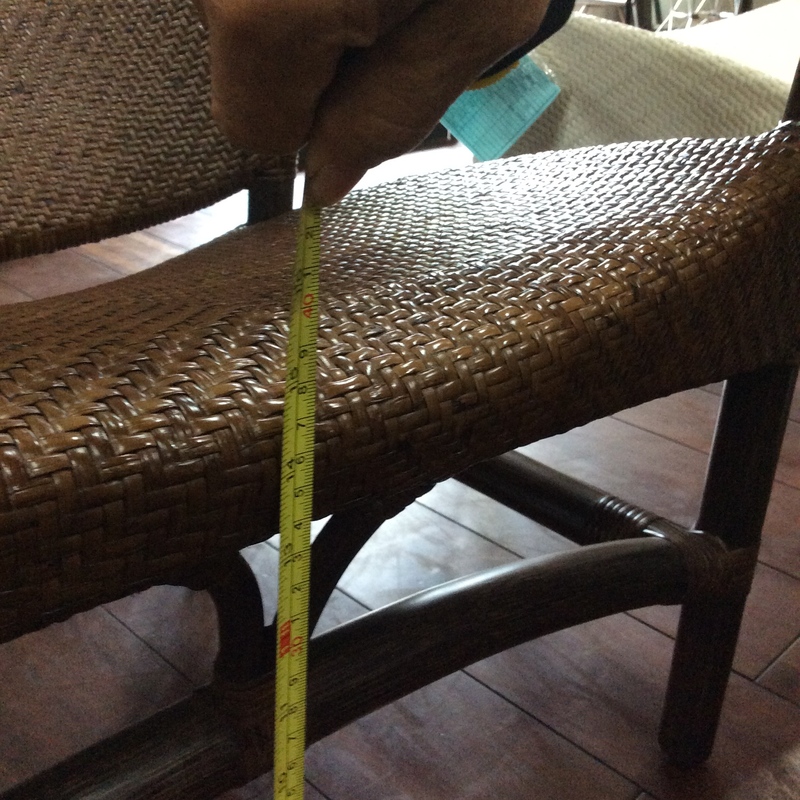 In 2014, the export of rattan furniture in Malaysia is ranked lowest with a value of RM35.14 million compared with wooden furniture exports valued at RM6.32 billion. The decline of the export value will negatively affect the revenues of rattan furniture industry and result in the risk of job loss. There are three phases conducted in this Knowledge Transfer Programme, which are: design, production, and commercialization. It is believed that craftsmen and rattan producers who engaged in rattan production will receive an immediate benefit. 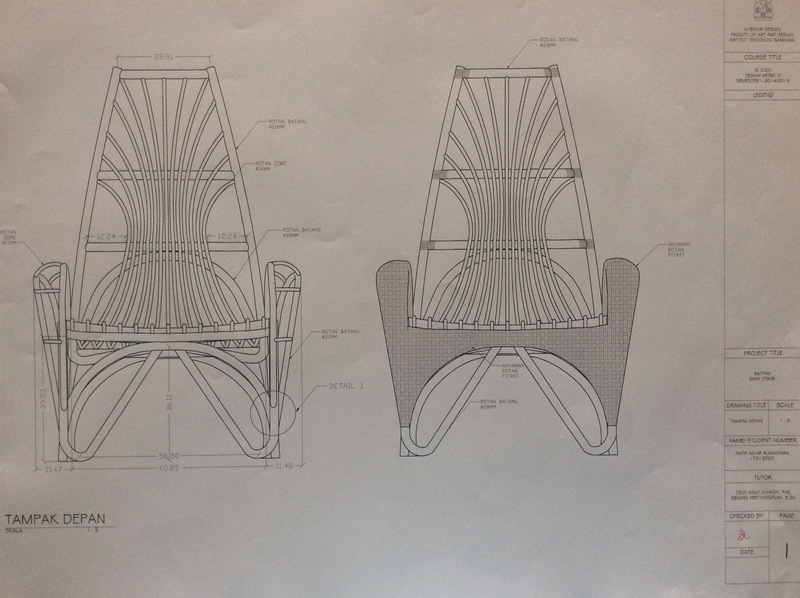 This article is a perspective from industrial design academicians to cope with the rattan furniture design development issue. This perspective could be referred and adapted by rattan industry players in Malaysia to be more updated with current R&D process. This would enable them to compete with the international market. With proper design development process, rattan furniture producers will be able to produce more desirable products that could attract foreign buyers so it might increase the export value of rattan furniture. It has been known that rattan material is elastic yet very strong. 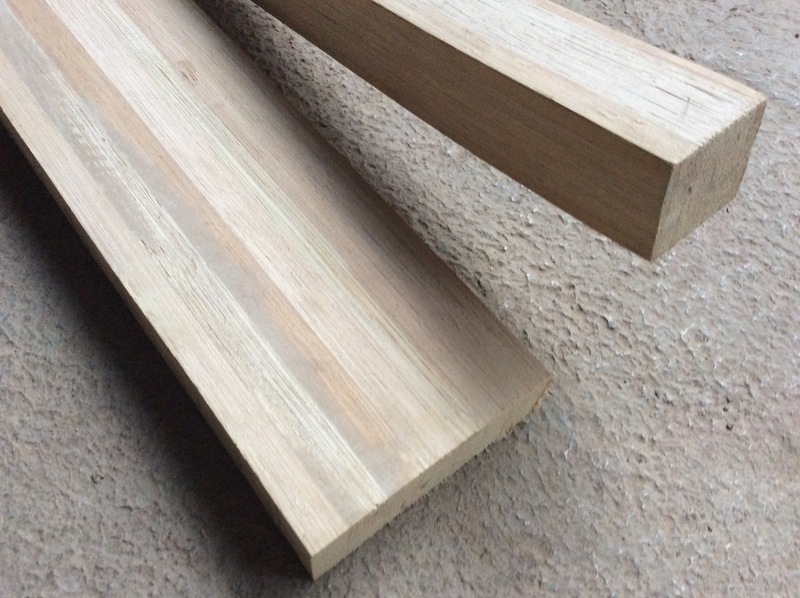 Rattan is friendly to be processed with a bare hand, this implies of less technology investment is required in the production process. Rattan furniture design is very popular with a recliner or swing-type chair at the beginning of 1960 until the end of 1990. Rattan furniture existed in many regular houses in Malaysia. The design of Rattan furniture corresponds with the level of expertise of the makers or the producers. 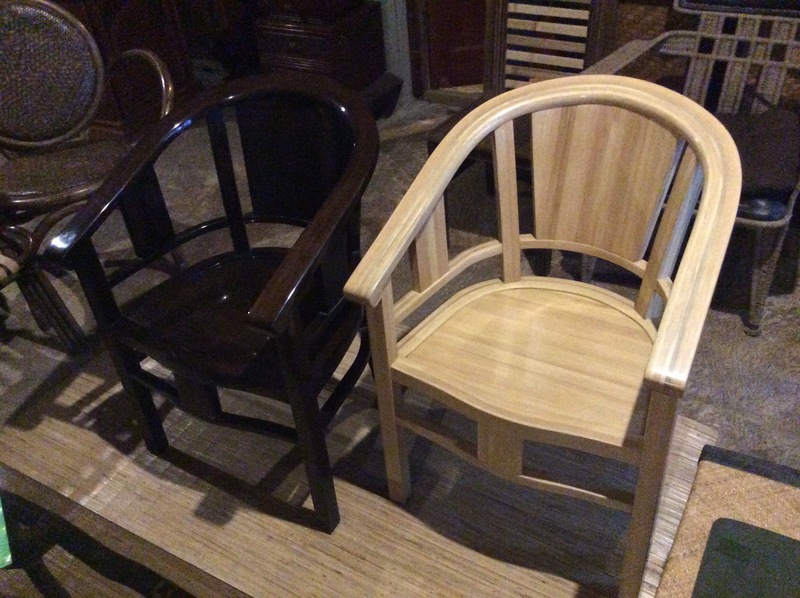 Besides of the skill level of the production of rattan furniture design, the selection of rattan species would also affect the rattan furniture design style. From early 2000 until now, rattan furniture export number keeps declining. 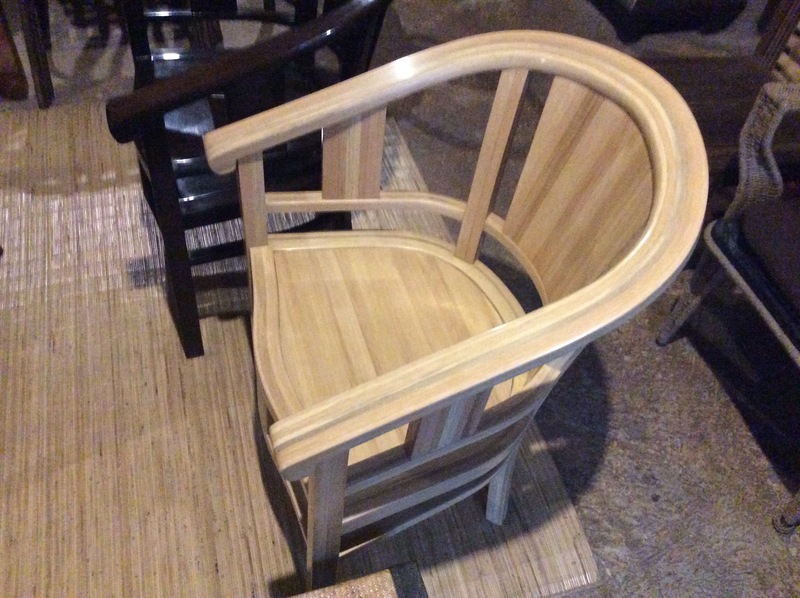 This is allegedly caused by the fast changing of design trends According to Dr. Jalaluddin Harun, director-general of the Malaysian Timber Board (MTIB), ‘Design’ is one of the key elements and the key focus on all furniture products that targeted for commercializing. Design development should be the starting point for the product before it is ready to market. 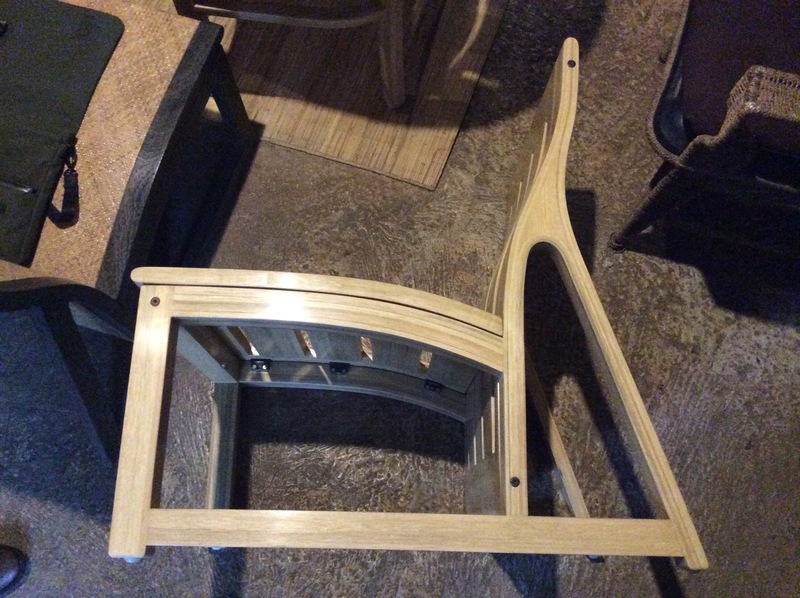 In order to produce more competitive products to increase the export value of rattan furniture, style, trend, and new design should be introduced to industry To respond the poor condition of Malaysian rattan furniture export that keeps declining. 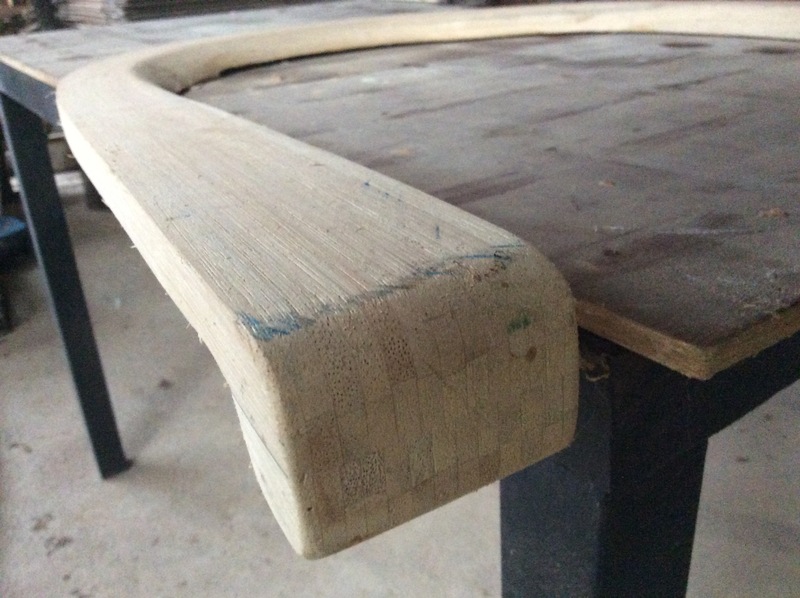 Our Knowledge Transfer Programme (KTP) is designed to set up some activities to challenge and stimulate creative resources from the key person in the rattan production. This programme is an educational support in a form of studio-type design-training to benefit craftsmen, producers. 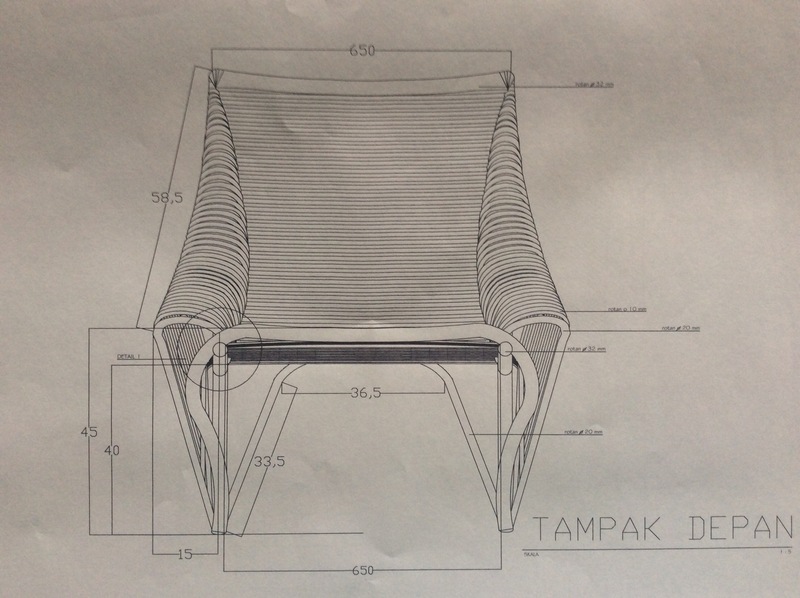 1st Design-training is to emphasize creativity that yields more unconventional application of rattan material. 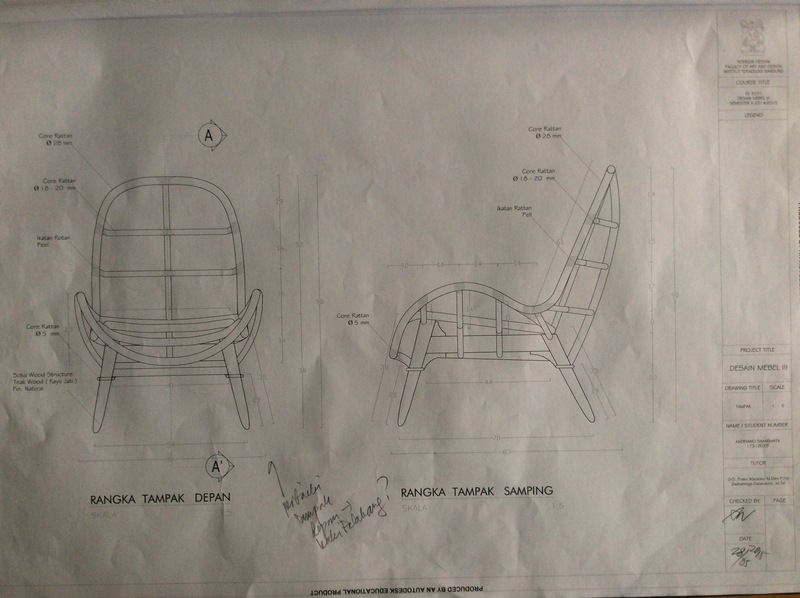 2nd Design-training is to pay attention to maintaining rattan unique characters furniture design. 3rd Design-training is stressed on the advance and detail mock-up making and background study of trend and market analysis. 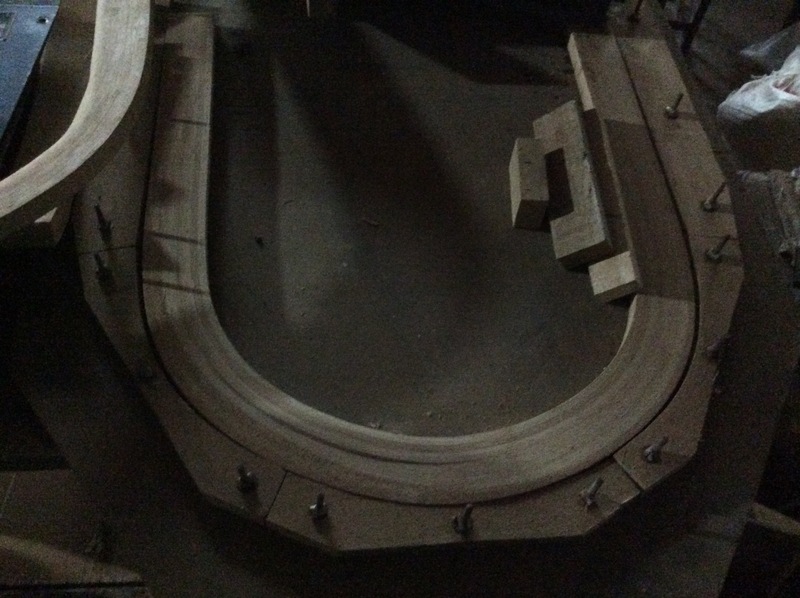 Those three activities are intended to participants to familiarize the special characteristic of rattan that would gain their knowledge of developing the idea using mock-up model making. Prior to delivering the program, we carefully study the literature of previous similar activities of Design-training from overseas. This prior study is to provide us a ground understanding on the related issues of technical, cognitive, market, and trend as a primary background to conduct such activity. 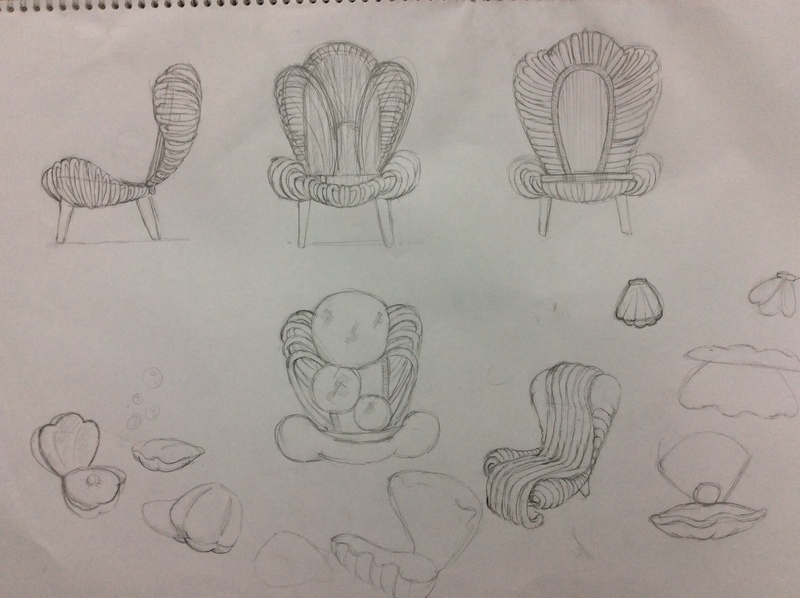 We finally concluded to apply a design-assistance-like situation referred to studio-based design tutorial. 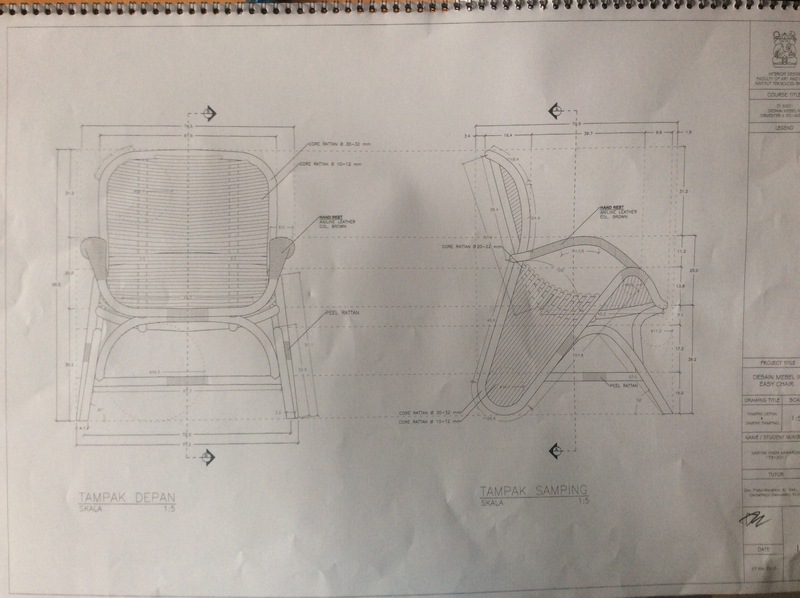 We apply a couching-clinic type where designer challenge and stimulate participants to produce more creative ideas by means of scale mock-up design. 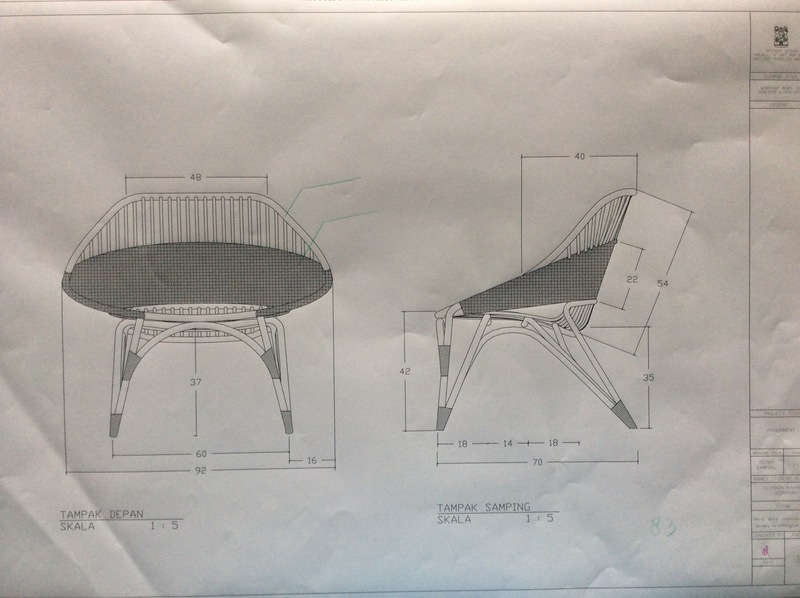 To deliver a technique of creative conceptualization process in rattan furniture design development. To raise the quality of production process and packaging design. To maintain the spirit of rattan furniture expert/craftsmen as a symbol of national heritage towards modernization challenge. 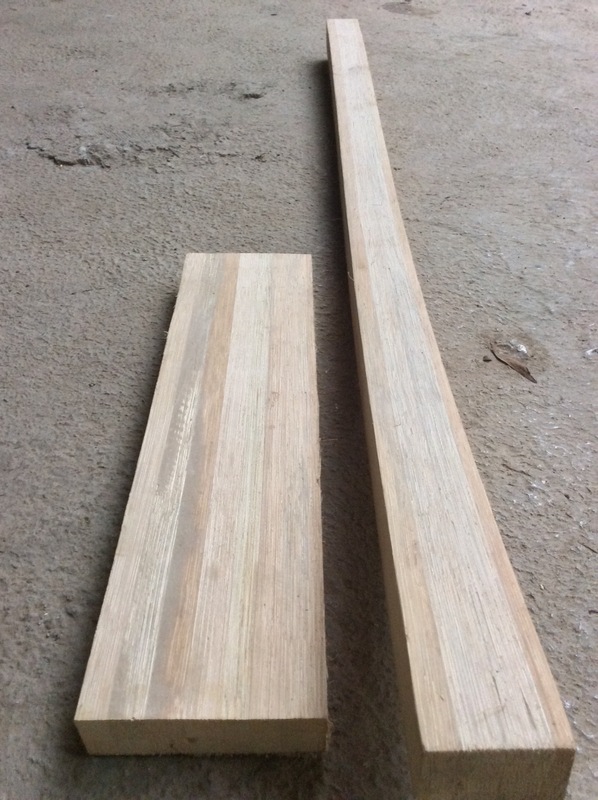 Rattan is among the most important commodities of the country where the raw material is always considered valuable along with the results of other major timber. Rattan is known for its strength, elastic and light. 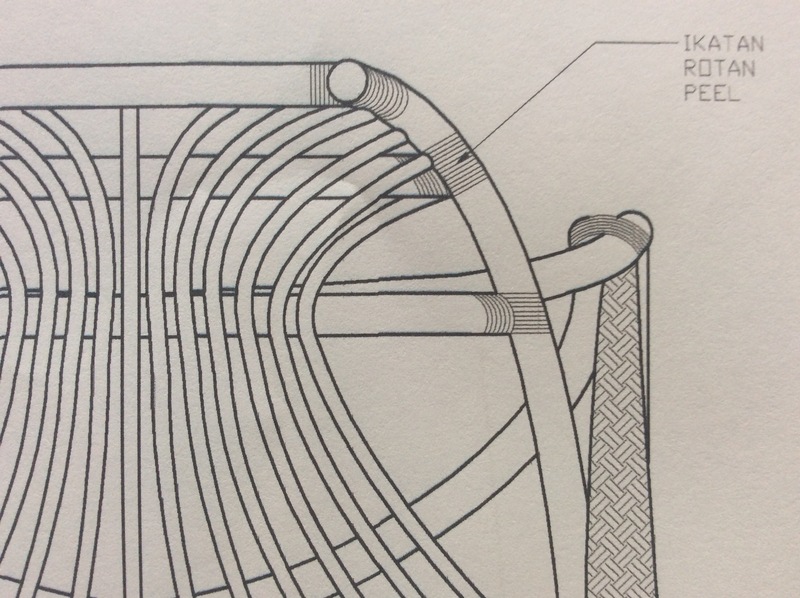 It is considerably easy to bend and weave without losing its properties and strength (Eskak, 2014). In 2012, imports of rattan products globally neared $745 million (UNcomtrade, 2013). However, the export value of rattan furniture in Malaysia for the last decade has dropped from 50% compared to previous years (see, Table 1). MTIB stated rattan-based furniture has the lowest rate of exports in 2014, at the rate of RM35.14 million compared based furniture wooden furniture which is at rate RM6.32 billion. This seems caused by less desirable design and less knowledge in design development so that difficult for producers to enter and compete in the global market. International Development Research Centre (IDRC) as described by W. Liese (2007) outline the strategy to enhance the use of the cane products: i. 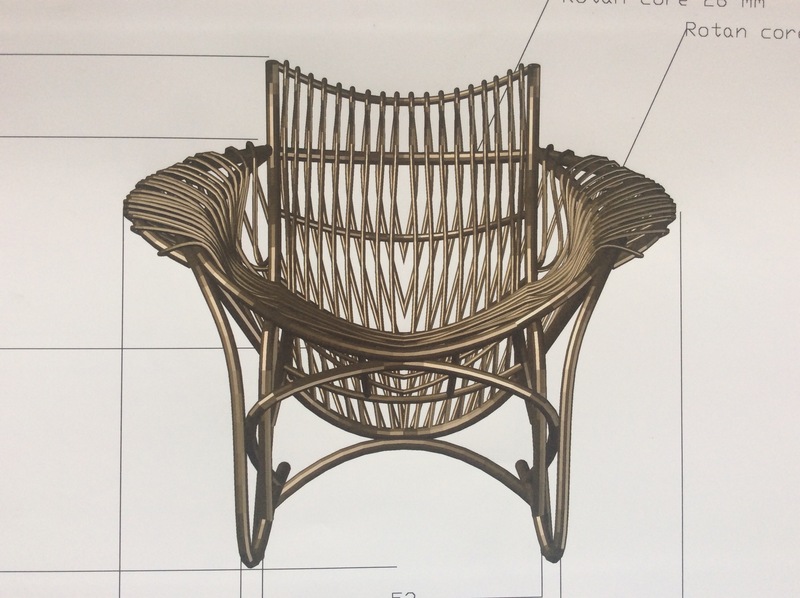 Increase the use of technology to enable the manufacture of a variety of products produced with a higher-quality level, especially the increase in the surface finish to enhance the aesthetic value and the durability of rattan products.ii. Colorless and improve the process of packaging used for the manufacture of wicker furniture; product packaging development and walls; iii. Effective design development costs in addition to applying contemporary features.To be competitive in the current global market, rattan furniture manufacturers and makers have to adopt an innovative strategy that will provide them the ability to innovate and to be more productive. Apart from the issue of material and transportation cost, the lack of design skills in the production has brought disadvantage. 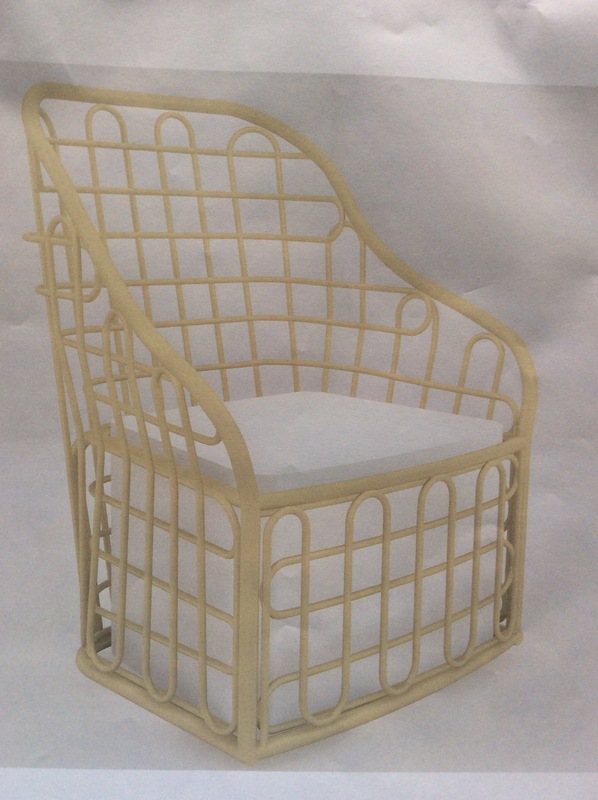 New ideas are necessary for rattan furniture producers to improve their product. In order to understand user preference on physical needs and psychological needs. A research conducted on the psychological needs of consumers revealed that more consumers are willing to pay a higher price for the higher level of satisfaction (Lu & Wang, 2011). Unfortunately, most craftsmen are unwilling to invest and to learn about design and development. 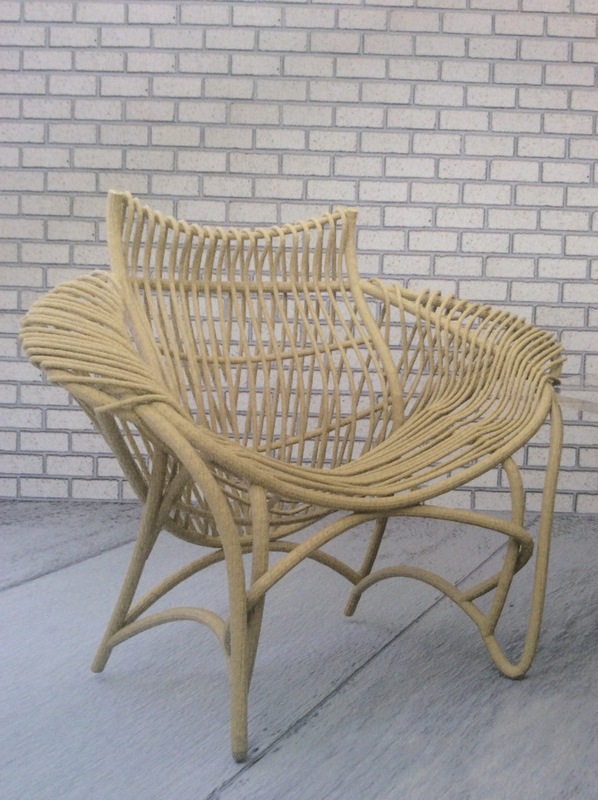 Colorless and improve the process of packaging used for the manufacture of wicker furniture; product packaging development and walls; Effective design development costs in addition to applying contemporary features.To be competitive in the current global market, rattan furniture manufacturers and makers have to adopt an innovative strategy that will provide them the ability to innovate and to be more productive. Apart from the issue of material and transportation cost, the lack of design skills in the production has brought disadvantage. 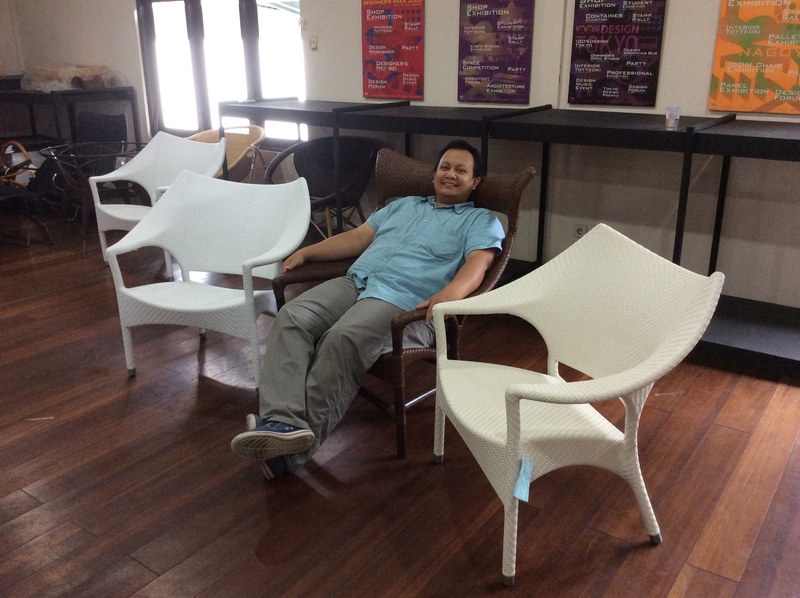 New ideas are necessary for rattan furniture producers to improve their product. In order to understand user preference on physical needs and psychological needs. A research conducted on the psychological needs of consumers revealed that more consumers are willing to pay a higher price for the higher level of satisfaction (Lu & Wang, 2011). Unfortunately, most craftsmen are unwilling to invest and to learn about design and development. Effective design development costs in addition to applying contemporary features.To be competitive in the current global market, rattan furniture manufacturers and makers have to adopt an innovative strategy that will provide them the ability to innovate and to be more productive. Apart from the issue of material and transportation cost, the lack of design skills in the production has brought disadvantage. 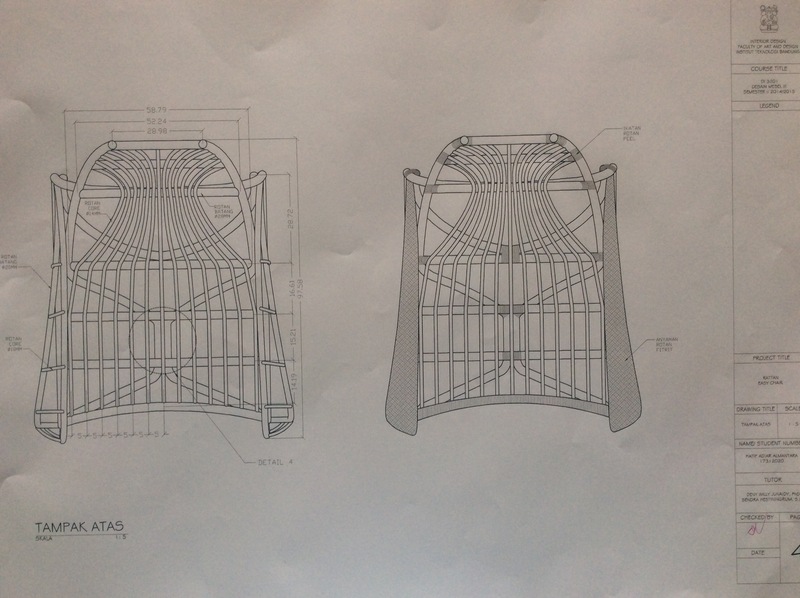 New ideas are necessary for rattan furniture producers to improve their product. In order to understand user preference on physical needs and psychological needs. A research conducted on the psychological needs of consumers revealed that more consumers are willing to pay a higher price for the higher level of satisfaction (Lu & Wang, 2011). Unfortunately, most craftsmen are unwilling to invest and to learn about design and development. As stated by Abdullah (2010) the main purpose of an industrial design process is to meet the needs of the users through the understanding of the intangible and tangible elements of design. The influence of industrial design is unrestricted as industrial design services can be applied in most industries (Ulrich & Eppinger, 2000). The process of industrial design has been described as phases of activities that are primarily user-driven rather than technology driven (Gamser, et al., 2006; Walsh, 1996). This implies that industrial design process relates mainly to aspects between the user and the artifact rather than the relations internal to the artifact. In some cases, the teaching of design and creativity to craftsmen/conservative individuals can be a difficult task because they possess conservative viewpoints and lack an understanding of the creative process. However, scholars believe that creativity can be learned by instruction and training. Efforts have been made to provide direct instruction that involves the students’ cognitive abilities and processes (Ripple 1999). 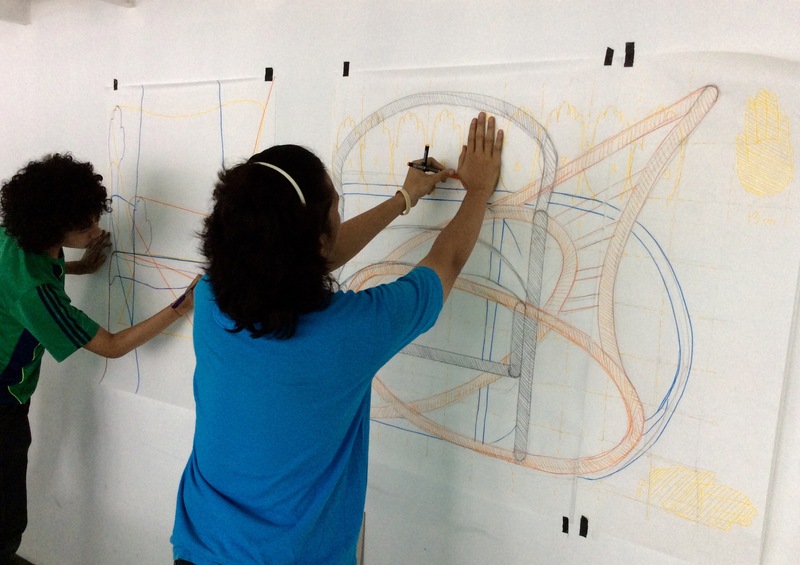 At a basic level, creativity and design-training hope to introduce widely known design methods. Gaps that may develop in the conceptual design process that occurs between craftsman/conservative individual and design trainers during a design-training program may correspond to the most obvious barrier to creative thinking: habit. The term habit refers to an individual’s well-learned ways of thinking and responding (Dodds, 1999). At the same time, a design-training program cannot simply rely on the typical conceptual design process because this process may serve as fixation (Junaidy, et. al 2015). 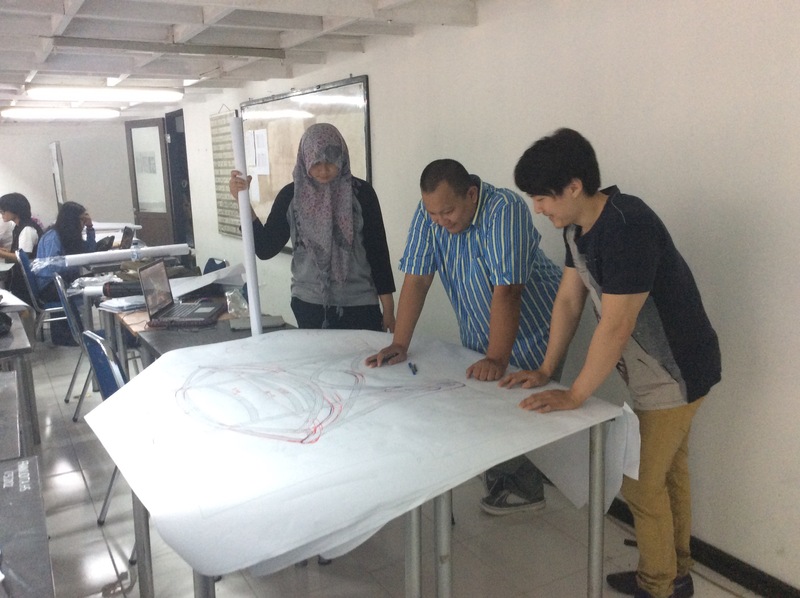 We conducted a design workshop/training in which we offered design-training (in-studio design-training). The study was carried out using traditional design method that comprised of three (3) phases. We believe that to challenge participants with practical experience would help them gaining better knowledge on this particular issue. People who directly engaged in true experience would comprehend knowledge better than acquiring merely from reading or writing. Here, we approach an informal yet planned workshop. The percentage of the transfer of knowledge from the researcher estimate around 80%. The third transfer phase is a hands-on skill. The first workshop is intended to transfer complete resource of rattan knowledge that held within a day. The objective of this first workshop is to provide a full information and issues from the past, present, and future of rattan design across the world. This is expected to trigger the industry so that they more enthusiast, be opened, and challenged to practice the current method of design development. 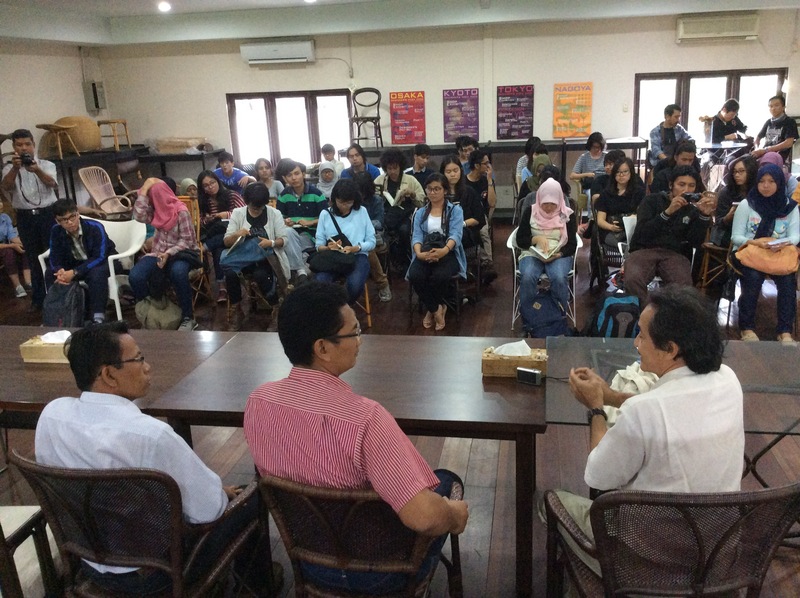 Further, This workshop also discussed and presented a comprehensive study of rattan furniture Design in Malaysia, Europe, and Southeast Asia. Through a complete resource of rattan, the potential would definitely convince the recipients from rattan industry to reconsider and revitalize their existence in order to keep up with current development. 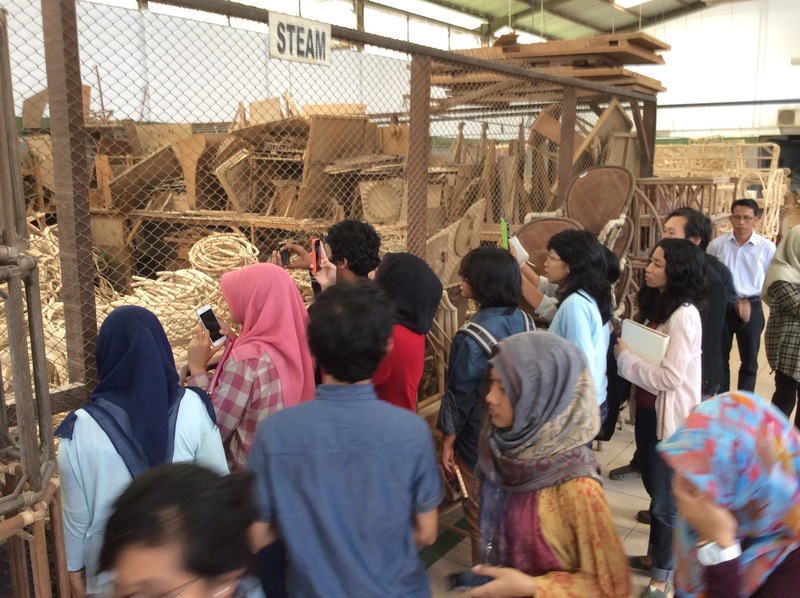 During the workshop, participants were challenged to explore the specific character of rattan that difficult to accomplish to other material such as wood and metal. 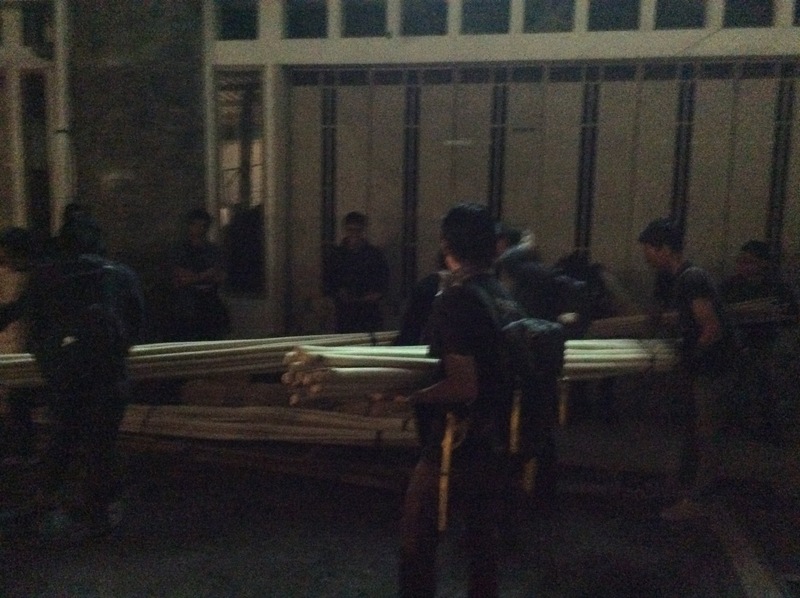 We find that many of the participants treated rattan as wood, this probably happened because either wood or fabricated board is the most familiar to their experience. 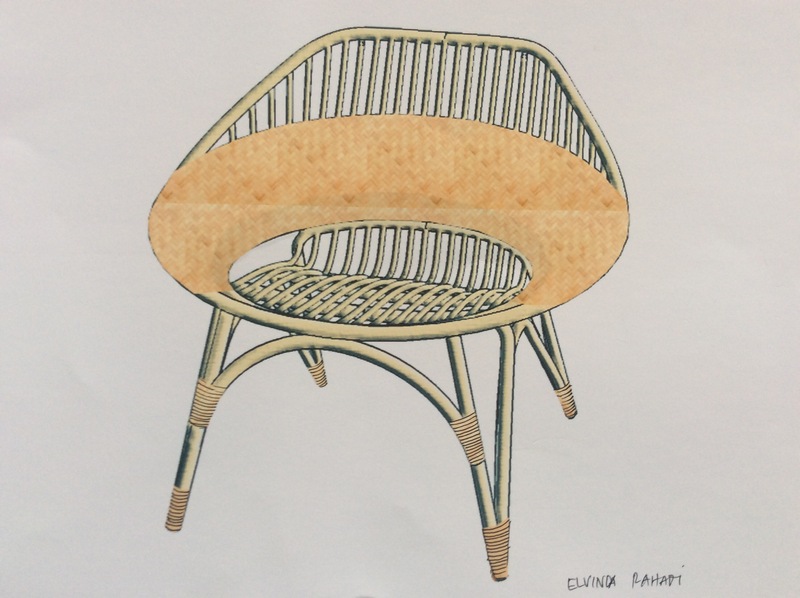 From this phase, it was quite clear that designers did not feel easy to disassociate rattan from wood; this unsurprisingly limited them to achieve or explore more unique form, shape or creative idea. In fact, rattan is known for its elastic and flexible characteristic, this character might help one to achieve desirable appearance, but on the other hand, it might be a barrier for certain idea as well. However, this second training phase is supposed to push out participants’ sense to be able to respond rattan characteristic. 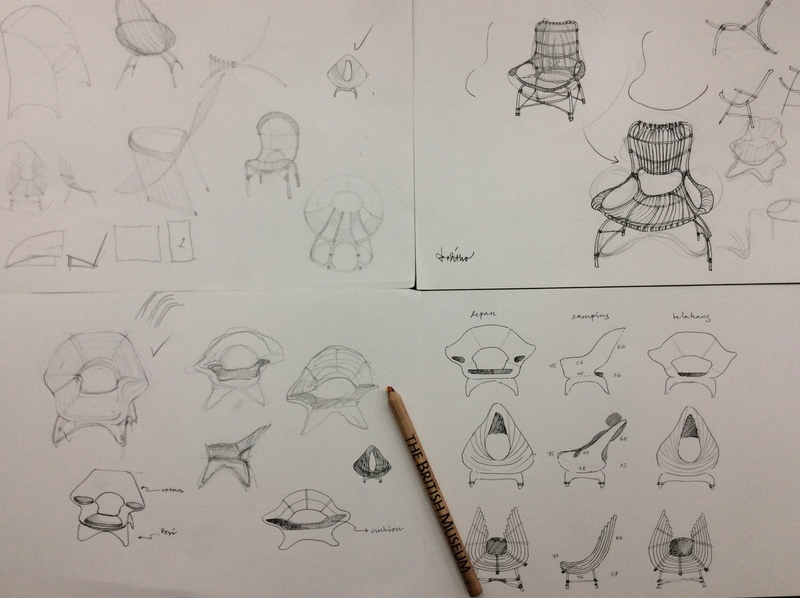 Besides participants were requested to comprehend the special character of rattan, they have been also reminded on what left during the idea development. Participants completely immersed on the technicality issue and the design styling, none of the participants matter to market-related issue. This means trend and consumers issue is completely detached from the design process. Further, this second phase workshop is meant to lead participants to consider the market issue and to apply the characteristic afterward. That issue was underlined throughout the design workshop since that issue is very critical in regards to a further stage of manufacturing the product. At the second phase of design workshop, all participants utilized a pseudo material (metal wire) as an example to approach with a scale model. However, using real material is supposed to an easier participant to sense the characteristic of the rattan. The hands-on method would help designers to understand more of the possibility and limitation of the material before entering the commercialization stage. 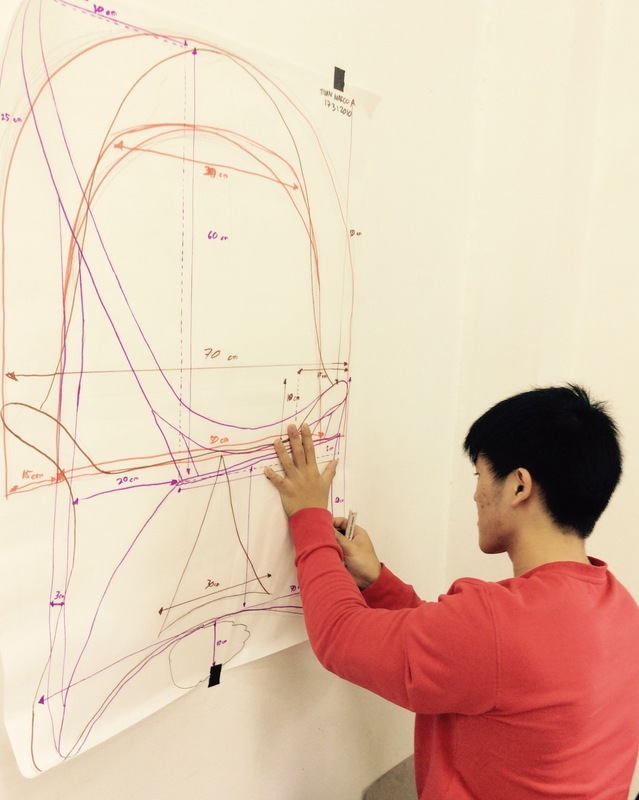 The KTP third design-training has just been conducted. The KTP third design-training is the ultimate act of this Programme. At this third phase, we emphasize on the advance detail mock-up making and put attention on trend and market analysis. The workshop is planned as the ultimate and final workshop that brings up all advance technique and latest knowledge to the participants (See, Fig. 6a, 6b, 6c). Hereafter is abbreviated as TRUST. Target (T1) is the objective of the workshop or training, this corresponds to the learning outcome of the program. This can be an introduction, technical know-how or design know-how. Resource (R) is a condition of the availability of rattan materials and specific tools. User (U) means of the subject or the recipient of a design-training, it is composed of participants, e.g. design student/ academician, master craftsman/ industry, and novice. 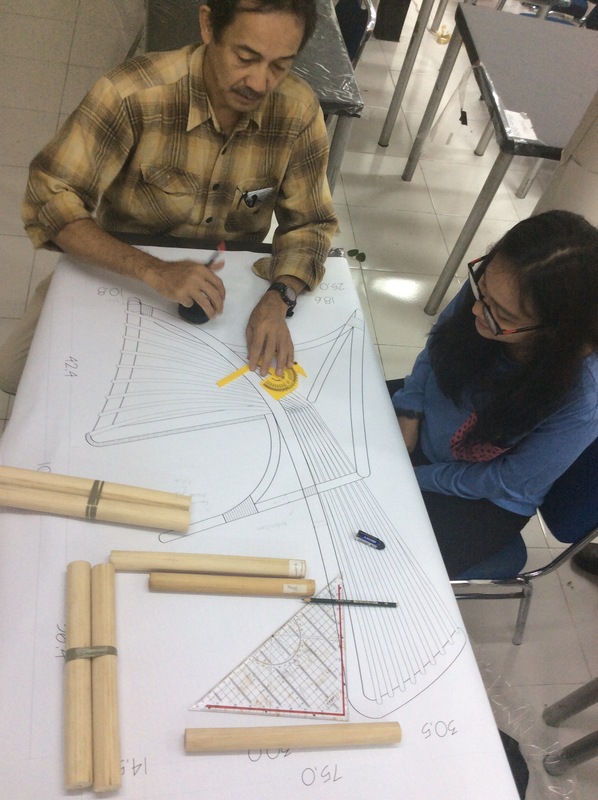 Skill (S) is so much related to the participant’s prior knowledge in relation to rattan production, it can be a design, business, craftsmanship and production knowledge. Time (T2) is the time allocated for the workshop, hours is the shortest time allocation, and days referred to 2-7 days, and lastly, months which implies of more solid knowledge of both, design creativity and rattan design technicality. Mock-up modeling method utilizing small diameter rattan, or substituted material e.g., PVC pipe. Figure 7a, 7b and 7c. 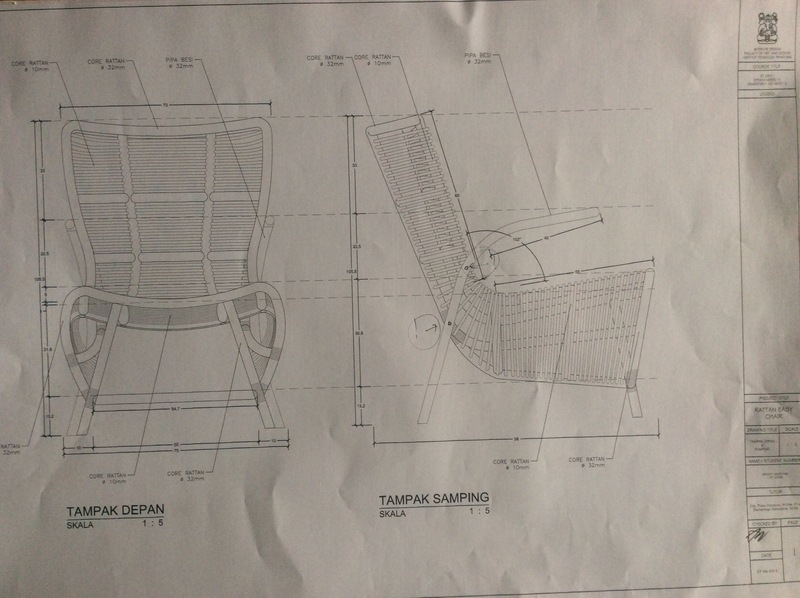 Mock-up modeling method utilizing small diameter rattan or substituted similar material e.g., PVC pipe. 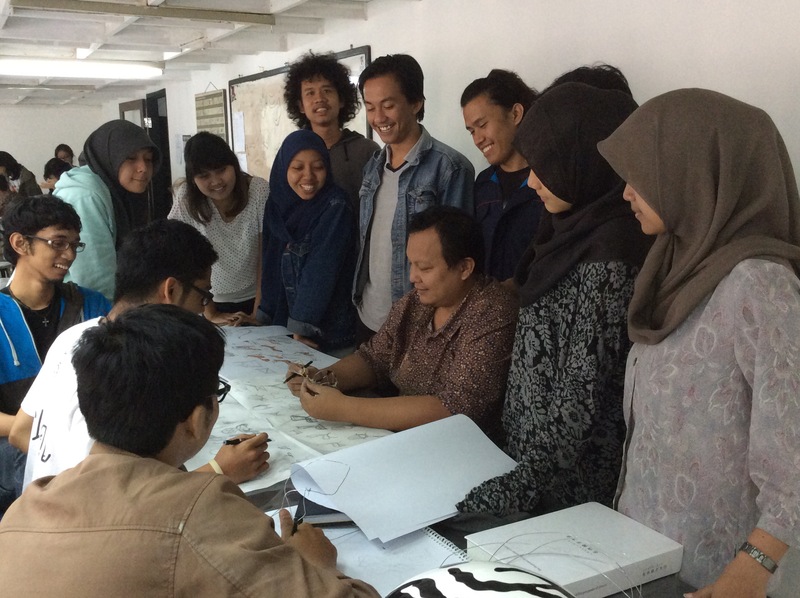 Schools of Architecture, Design, and Conservation training in Cirebon (2014), (b). Pusat Inovasi Rotan Indonesia (PIRNAS) and (c). Designer Dispatch Service/DDS2016, Ministry of Industry, Indonesia). 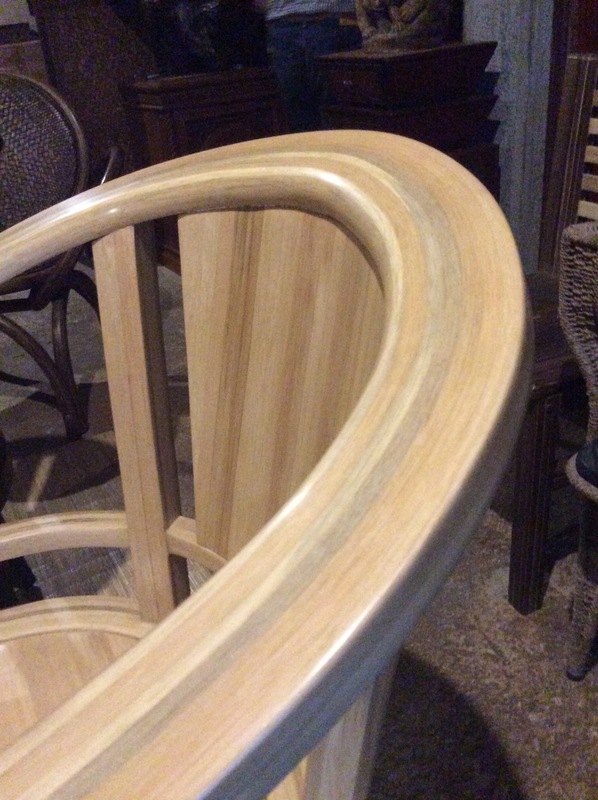 There are hindrances to revitalize rattan design development in industry, the main hindrance is very less support has been given to promote rattan as national potential and heritage. Learning from the success from other countries in market competition Government, University, Industry, and Community are required to take extra effort to promote rattan as valuable resources. This can also be infusing rattan knowledge in the content of educational activities as curriculum, seminar, workshop, competition, training, branding, etc. Support from government, university, and industry and also the community would ensure the future success. This program should be implemented consistently and be maintained its sustainability. Industry must consider of setting-up an in-house professional designer or R&D team to be able to achieve more desirable products towards commercialization on the international market. This project was funded by Knowledge Transfer Programme (KTP) Scheme entitle “Pembangunan rekabentuk prototaip kerusi rotan ke arah nilai komersial sektor komoditi”. Abdullah, M. (2010). A Research Overview of Industrial Design Framework for Modula Product Design“. Proceeding of the Design 2010. Vol. 1. ISBN 978-953-7738-04-4. Dodds, Rebecca A, and Steven M. Smith, 1999. Fixation. In Encyclopedia of Creativity, edited by Mark A. Runco and Steven R. Pritzker, Vol. 1: 725-728, San Diego, London: Academic Press. Eskak, E. (2014). 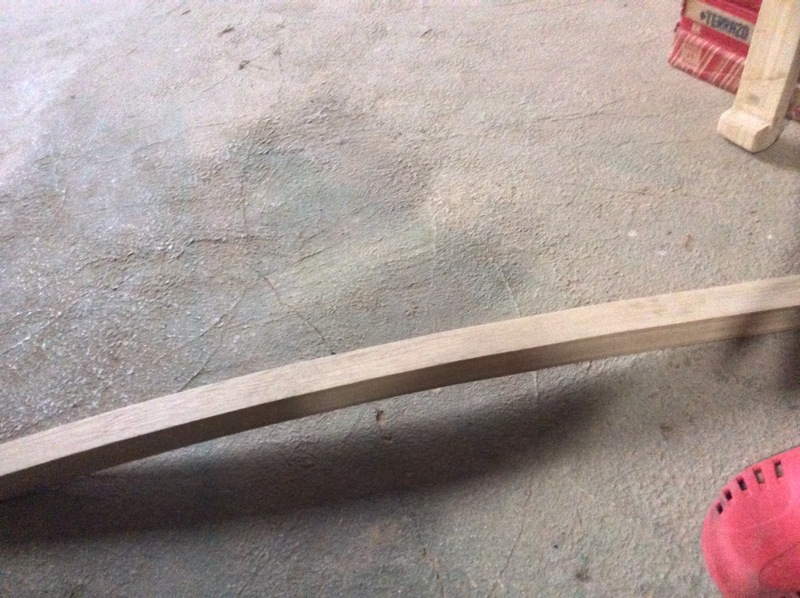 Kajian pengembangan mebel rotan di Sumbawa Barat. Dinamika Kerajinan dan Batik, Vol.31, No.1. Gamser, et al., (2006). Design and Competitive Advantage in Technology-driven Sectors: The Role of Usability and Aesthetics in Dutch IT Companies”. Technology Analysis and Strategic Management. 18 (5), 561-580. Junaidy, D. W., Kaner, J., Ioras, F., and Nagai, Y. 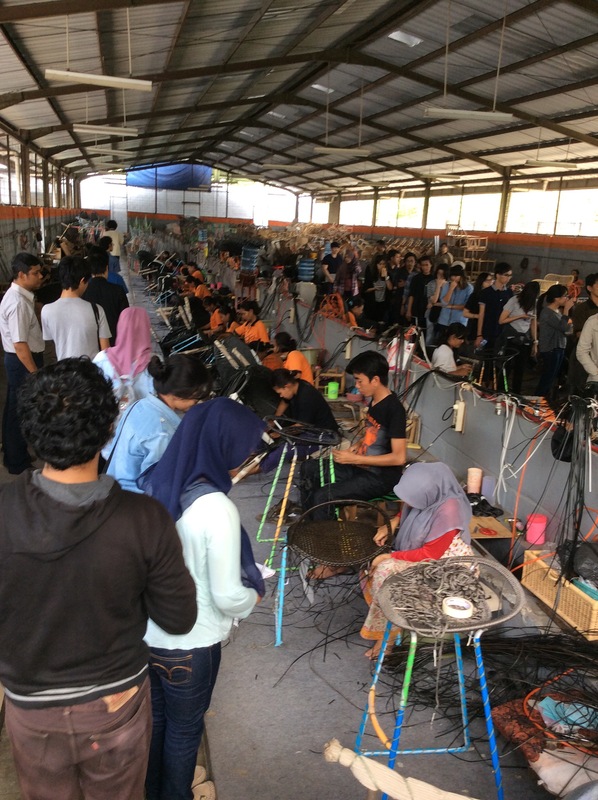 (2015) Capturing characteristics of the conceptual ideation process of master craftspersons to inform design education: a comparative study of rural craft practitioners in Indonesia and in the UK, J. Design Research, Vol. 13, No. 4, pp.395–423. Liese, W. (2007). Challenges and constraints in rattan processing and utilization. Rattan Current Research Issues and Prospects for Conservation and Sustainable Development, 35-42. Ripple, Richard E. (1999). Teaching creativity. 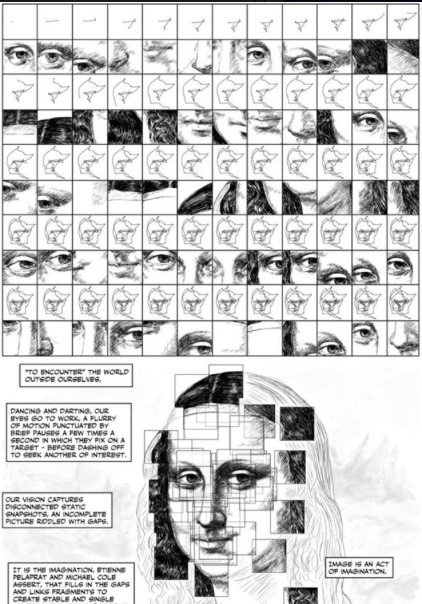 In Encyclopedia of Creativity, edited by Mark A. Runco and Steven R. Pritzker Vol. 2: 629-638, San Diego, London: Academic Press. Walsh, V. (1996). “Design, Innovation and the Boundaries of the Firm”. Research Policy. 25(4), 509-529. Teknik Analisa Jaringan Konsep Asosiatif dapat mengungkap struktur kerumitan koneksi mental atau kesan mendalam manusia (profound understanding) terhadap arketip obyek (mother figure). Konsep asosiatif membantu mensortir atribut kata sebagai representasi sejati dari impresi mendalam antara manusia, proses dan artefak. 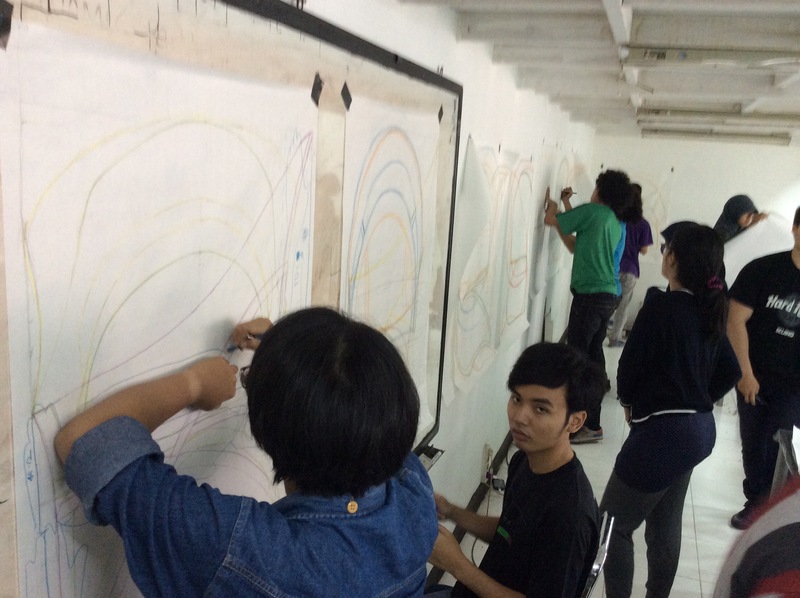 Tulisan ini menyelidiki tingkat kognisi pengrajin dan desainer (pelatih desain) dalam proses pelatihan desain. Teknik Analisa Jaringan Konsep Asosiatif digunakan untuk mengekstrak pikiran yang diverbalkan dari para pengrajin dan desainer dalam sebuah eksperimen konseptualisasi merancang wadah buah. Hasilnya verbalisasi kemudian diidentifikasi melalui hubungan semantik berdasarkan analisis faktor. Hasilnya menunjukan pengrajin cenderung mengaktifkan kognisi kreatif dengan fokus konseptualisasi lebih spesifik pada penampilan produk dan aspek teknis, seperti ‘operasi’ (mengganti, mengurangi, dll) dan ‘bentuk’ (pinggang, tubuh, dll). Sebaliknya, desainer menunjukkan konseptualisasi yang lebih terbuka pada isu yang berkaitan dengan ‘persekitaran’ seperti adegan (pesta, norma, dll) dan daya tarik (segar, piring, dll). Hasil ini menunjukkan bahwa konseptualisasi kreatif pengrajin mudah terjebak pada level rendah proses kreatif, dan hambatan ini dapat ditingkatkan dengan memodifikasi konseptualisasi yang lebih terbuka. 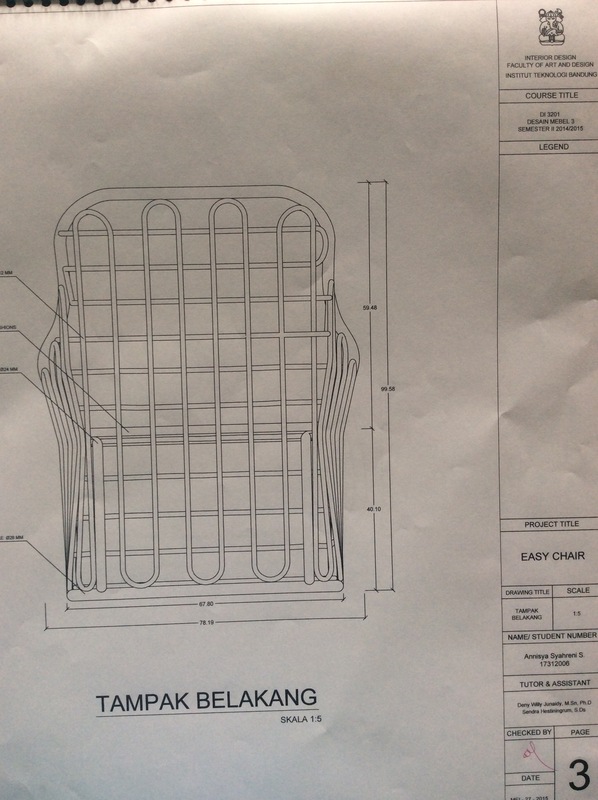 Pelatihan Desain adalah kegiatan transfer pengetahuan bagi pengembangan sumberdaya manusia pada industri kecil di berbagai daerah yang diselenggarakan baik oleh lembaga swasta atau pemerintah. Aktivitas pelatihan desain, khususnya ditujukan bagi para pengrajin berupa pelatihan kreativitas untuk pengembangan produk. Deliveri dari kegiatan ini serupa dengan praktek bimbingan atau konsultasi desain di universitas (in-studio type). Tujuan dari pelatihan desain adalah meningkatkan kreativitas pengrajin dalam menghasilkan produk kreatif sehingga diminati oleh pasar (lihat, Gambar 1). Pihak utama yang terlibat secara langsung dalam kegiatan pelatihan desain adalah (1) pengrajin, seorang pengrajin senior (master craftsperson) yang memiliki keterbatasan dalam pendidikan formal, namun memiliki kemampuan khusus dalam hal keterampilan kerajinan /pertukangan yang didapatkan secara turun temurun. 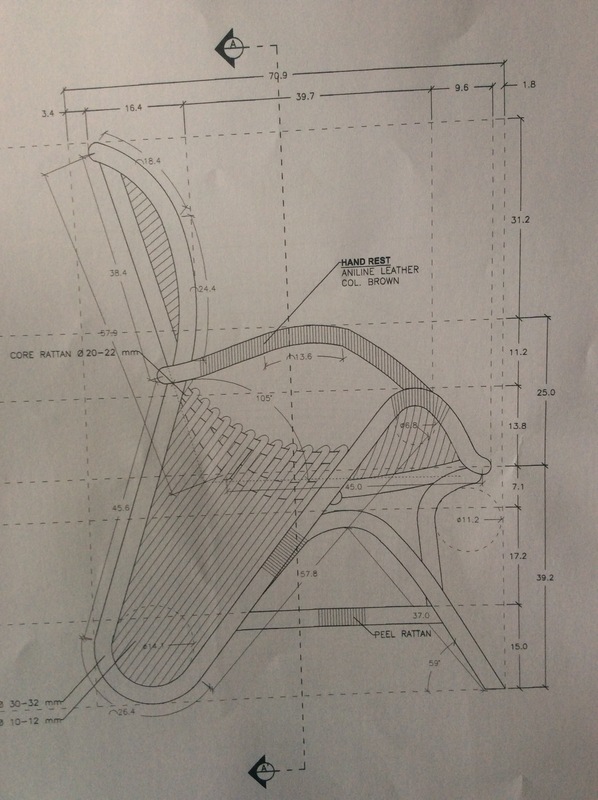 Berikutnya, (2) seorang pelatih desain, (selanjutnya disebut desainer) adalah individu yang memperoleh pendidikan desain secara formal dalam hal desain, (contoh: lulusan desain produk, desain interior dan arsitektur) yang memiliki kemampuan sebagai instruktur dalam sebuah pelatihan desain yang bertujuan mempromosikan kerajinan nasional. – Elemen dan Prinsip Desain & Creativity Icebreaker kreativitas untuk penyesuaian. 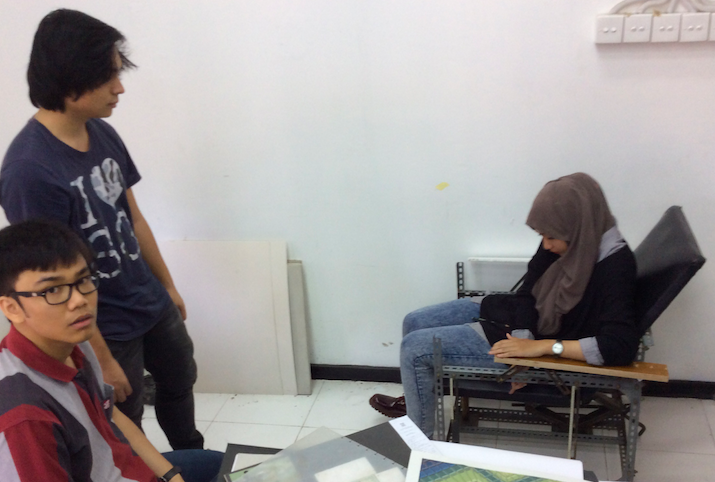 Sesi III: 1:1 Workshop prototyping. – Mock-up, variasi dan finishing. Umumnya penelitian di bidang kreativitas lebih banyak terfokus pada peran stimulus dalam mencapai solusi kreatif daripada tentang hambatan dalam kreativitas. Selain stimulus, sebagian kecil penelitian bidang kreativitas mencoba mengidentifikasi dan mencegah timbulnya halangan dalam proses kreatif (mitigation in fixation) . Namun demikian, masih sulit ditemukan penelitian kreatifitas yang mempelajari potensi dari halangan kreatifitas (potential of creativity barrier). Oleh karenanya, tulisan ini memaparkan tentang cara memanfaatkan halangan dalam proses kreatif, khususnya pada individu-individu dengan cara pandang konservatif atau konvensional sebagai penyebab konstruksi mental yang menghalangi kemampuan seseorang dalam mengembangkan ide kreatif. Cara pandang konservatif cenderung menjadi bagian dari kondisi mental pengrajin tradisional. 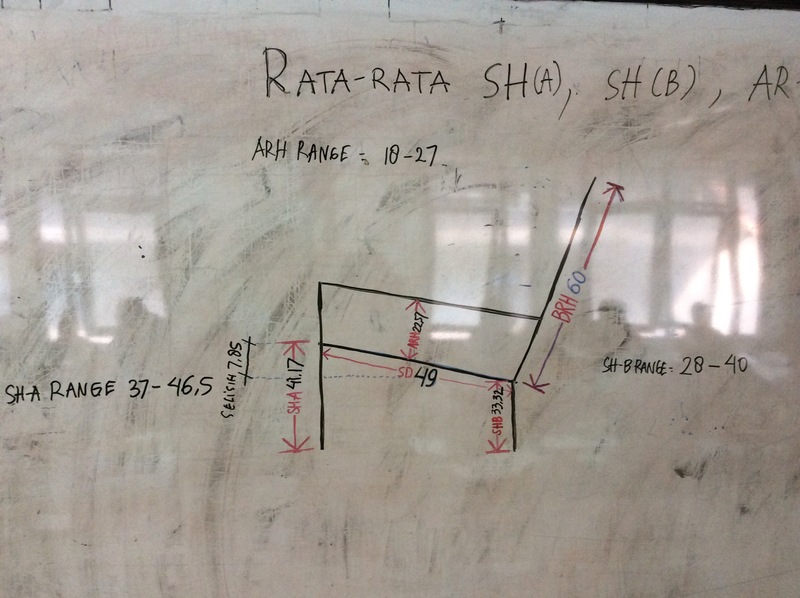 Pendidikan formal desain pada dasarnya memitigasi rintangan kognitif, dan belum ada upaya memahami potensi dalam rintangan kognitif tersebut. Mengakomodasi hambatan kognitif dalam berupa cara pandang konservatif dapat menjad menjadi fitur kurikulum khusus bagi para pengrajin tradisional untuk dapat menghasilkan ide lebih kreatif. Metode Analisa Jaringan Konsep Asosiatif dapat membantu mengungkap struktur kerumitan koneksi mental atau kesan/ekspresi mendalam manusia (profound understanding) terhadap arketip obyek (mother figure) dalam kaitannya dengan proses konseptualisasi kreatif. Teknik ini menggali kesan/ekspresi yang diperoleh individu melalui ekspresi eksplisit (kata-kata) yang dikalkulasi dengan network analysis dan memanfaatkan basis data kamus makna asosiatif. Teknik ini dinamakan Analisa Jaringan Konsep Asosiatif (Associative Concept Network Analysis) yang kemudian menjadi protokol baru dalam mengkaji kesan/ekspresi mendalam (in-depth impression) individu terhadap obyek. Sensitivitas laten berupa kesan/ekspresi mendalam (in-depth impression) yang sulit terungkapkan secara eksplisit oleh individu dapat dimunculkan dalam wujud struktur jaringan asosiasi kata. 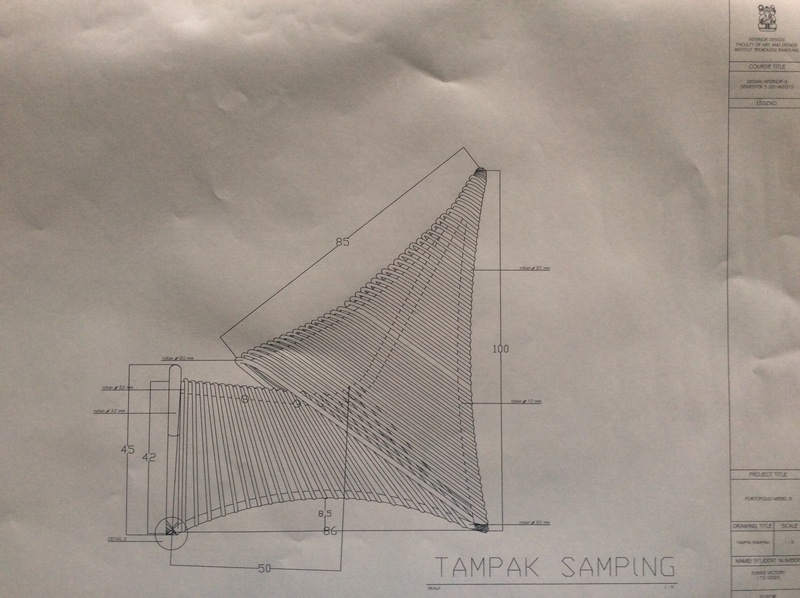 Kesan/ekspresi eksplisit (kata-kata) terhadap obyek hanya mengandung kesan awal (surface impression) perlu dianalisis untuk mendapatkan kesan/ekspresi yang tidak terungkap . 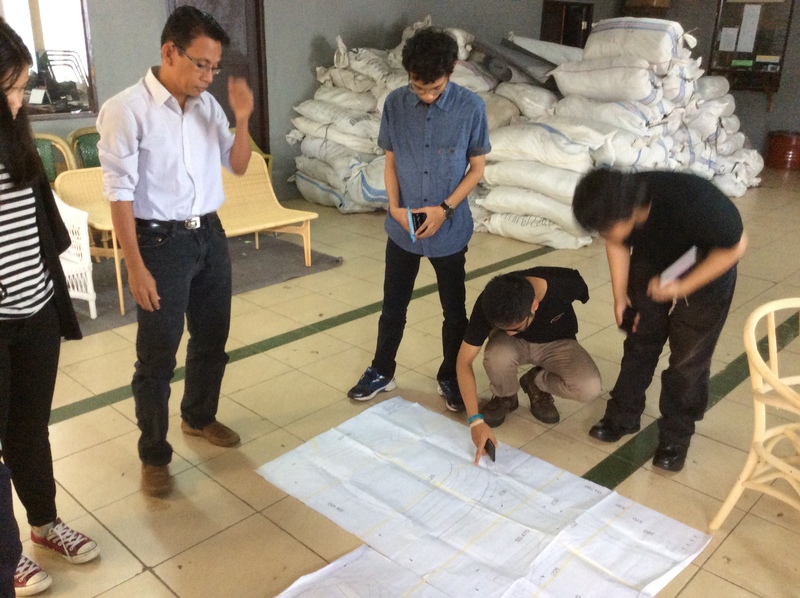 Dalam proses tahap awal konseptualisasi pada pelatihan desain, ekspresi eksplisit merupakan hasil dari analisa dangkal yang diperoleh dari penafsiran cepat ketika membayangkan produk. Kesan yang mendalam justeru yang mengaktivasi ekspresi eksplisit tersebut (lihat, Gambar 2). Oleh karenanya, dapat disimpulkan ekspresi eksplisit awal beroperasi pada kognisi tahap permukaan. Namun demikian, istilah ekspresi implisit mengacu pada sesuatu yang tidak secara eksplisit dikenali dan diungkapkan (Reingold et al., 2003). Bentuk kognisi mendasar ini mungkin sukar untuk diungkapkan, selanjutnya, hal ini disebut sebagai tahap kogniti yang mendalam (the in-depth cognitive levels) [4, 5, 6]. Kesan atau ekspresi implisit tersirat dalam ekspresi eksplisit yang berhubungan dengan kesan mendalam. 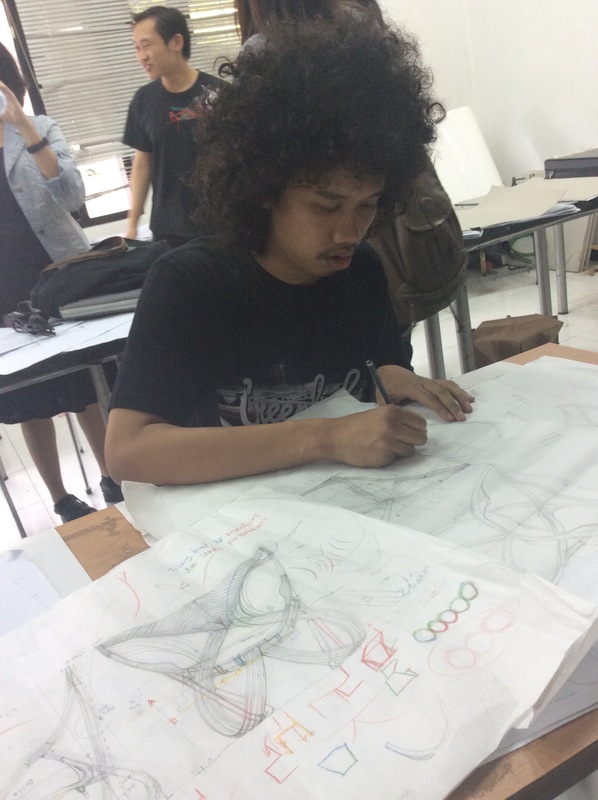 Proses tersebut mengandung konsep metaforik yang sangat kaya dan menjadi fitur kunci dari kognisi selama proses desain kreatif (lihat, Gambar 2). Studi-studi lain sebelumnya juga telah menyimpulkan bahwa penggunaan kata-kata yang kaya metafor membentuk dasar dari desain kreatif [7, 8, 9]. Gambar-2 Menangkap kesan mendalam (in-depth impression) dalam kognisi kreatif dengan penggunaan konsep kamus asosiatif. Untuk mengevaluasi tingkat kognisi berdasarkan ekspresi subyektif, kami menggunakan teknik Think-Aloud sebagai bagian dari protokol analisis yang menghasilkan laporan lisan dari proses berpikir  Subjek diinstruksikan untuk mengekspresikan pengalaman dan pengamatan mereka ketika melakukan proses kreatif tahap awal khususnya guna mengidentifikasi cara pandang yang berbeda (reframing). Pemikiran yang diverbalkan dalam bentuk ekspresi kata-kata mencerminkan aspek-aspek proses kognitif umum yang kemudian dapat diselidiki dengan menggunakan metode jaringan konsep yang didasarkan konsep kamus asosiatif. Ekspresi individu dalam bentuk ucapan dan makna asosiatif menjadi studi khusus untuk memahami komunikasi. Sebuah kata yang terucap yang merupakan representasi kekayaan dari kata sumber yang tidak terekspresikan secara langsung. Ekspresi kata terbagi menjadi enam sub-jenis: konotatif, kolokatif, sosial, afektif, terefleksi, dan tematik . Ketika sesorang individu mengekspresikan ide secara verbal, maka dalam model mentalnya yang diwujudkan sebagai jaringan konsep (conceptual network) menggambarkan struktur memori sebagai sebuah sistem asosiatif, di mana ide tunggal dapat berisi beberapa makna (polysemous). Sebuah jaringan konsep dapat divisualisasikan melalui model komputasi untuk mereproduksi aspek ekspresi kata-kata yang diamati pada proses rekognisi proses kreatif. Cara ini sangat sesuai untuk menganalisa mengungkap korelasi ekspresi yang tersembunyi di antara konsep-konsep (ekspresi kata). Kamus konsep yang digunakan dalam jaringan konseptual berasal di basisdata University of South Florida-Free Association Norms USF-FAN). Dari sedikit kamus asosiatif yang tersedia di dunia, kamus konsep asosiatif USF-FAN ini adalah kamus dengan kumpulan norma kata terbanyak yang pernah dikumpulkan di Amerika Serikat [12, 13] (lihat, Gambar 3). Untuk mengembangkan program pelatihan desain yang sesuai dengan kognisi individu sasarannya, maka membandingkan karakteristik konsep asosiatif dalam proses kreatif pengrajin dan desainer dapat memberikan gambaran kelemahan dan potensi. 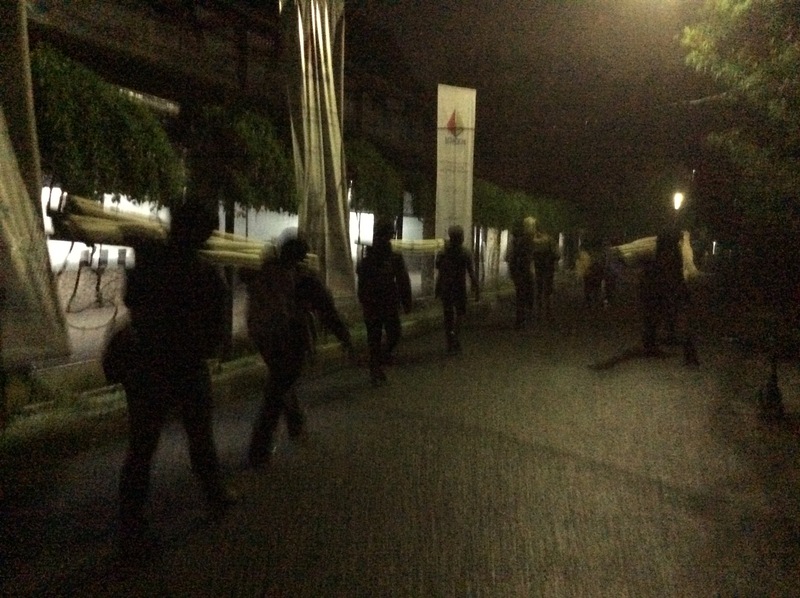 Delapan subyek terlibat dalam penelitian ini: empat pengrajin senior yang memiliki keahlian khusus dalam kerajinan bambu dan rotan. 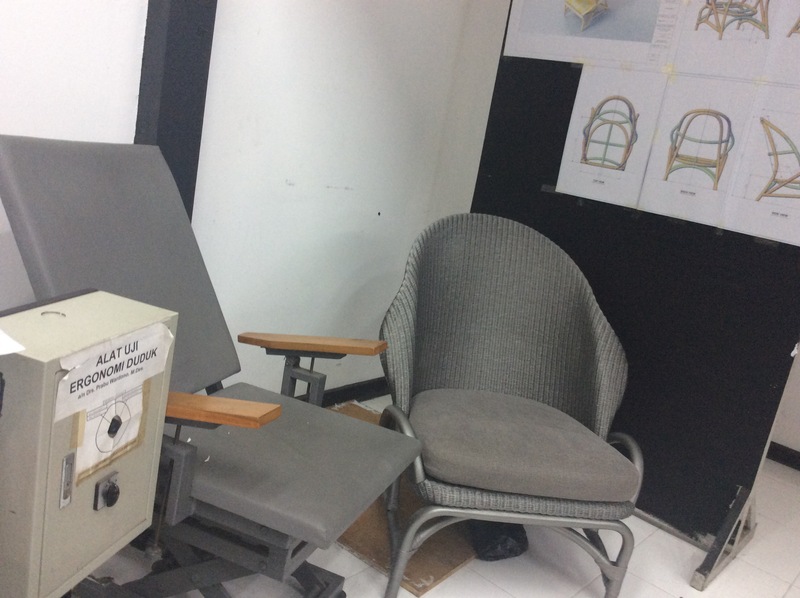 Empat desainer lulusan dari program desain industri yang memiliki pengalaman sebagai instruktur dalam beberapa program pelatihan desain kerajinan. Para peserta (pengrajin dan desainer) tidak secara langsung praktek menggambar karena yang perlu diperoleh adalah memahami konsep-konsep asosiatif fundamental. 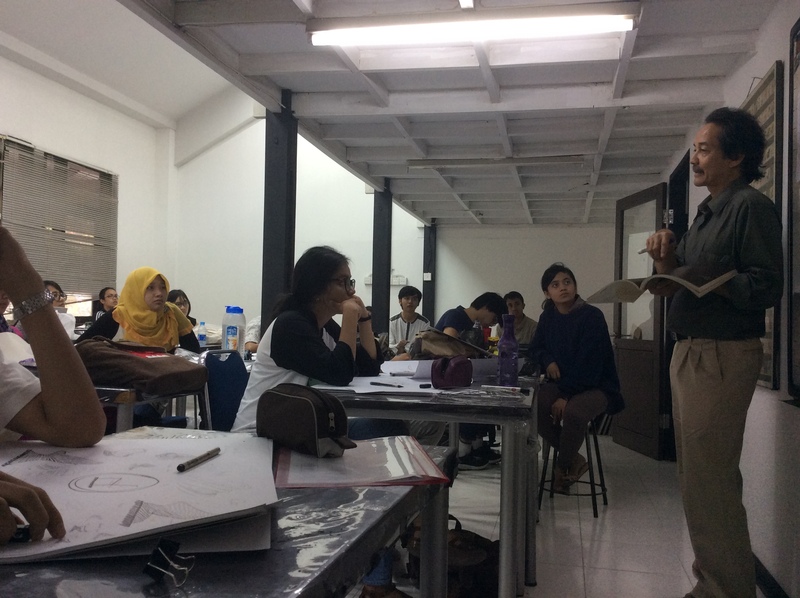 Eksperimen juga menghindari instruksi kaku tentang penentuan tema desain, segmentasi pasar, atau fungsi desain, karena penyediaan informasi yang berlebihan mungkin tidak adil dan membingungkan. Instruksi yang minimal memungkinkan pengamatan terfokus pada pada upaya awal mereka mengalami fase reframing. Tahap protokol Think-Aloud dilakukan secara terpisah dengan masing-masing peserta untuk menghindari pemikiran yang meniru. Seluruh partisipan diberi kebebasan mengekspresikan ide-ide mereka. Tidak ada batas waktu yang dikenakan pada peserta selama percobaan ini. Rata-rata, peserta mengambil sekitar enam menit untuk mengungkapkan imajinasi mereka. Semua prosedur direkam sebagai data verbal yang akan diolah kemudian (lihat, Gambar 3). Selanjutnya, data ekspresi verbal (kata-kata) tersebut disortir menjadi kata dasar dengan cara menghilangkan beberapa frase seperti kata penghubung, preposisi, kata ganti, serta ekspresi informal atau ungkapan lain yang kurang relevan. Akhirnya, kami transkripsikan data lisan tersebut sehingga terdiri hanya dari kata benda, kata sifat, kata keterangan, dan kata kerja yang ditranslasikan ke dalam bahasa Inggris. Berikutnya, data tersebut divisualisasikan dengan menggunakan network analysis software Pajek 2.05 berdasarkan 2D layer arah Y dengan menerapkan kamus asosiatif USF-FAN sebagai struktur jaringankata asosiatif. Visualisasi menghasilkan jaringan konseptual (struktur kata-kata asosiatif) dengan berbagai nilai asosiasi mulai dari yang rendah hingga yang kata dengan asosiasi tinggi (polysemous) seperti yang ditunjukkan oleh skor Out-Degree Centrality (ODC). Selanjutnya, kami mengidentifikasi nilai dan ragam makana asosiatif jaringan konsep dengan menganalisis hubungan semantik. Gambar-3 Tahapan identifikasi jaringan konsep dalam proses konseptualisasi kreatif desainer dan pengrajin dalam eksperimen imajinasi awal mendesain ulang wadah buah. Setelah delapan desainer dan pengrajin menyampaikan ekspresi verbalisasi dalam tahap awal konseptualisasi merancang desain baru sebuah wadah buah, maka, dengan menggunakan aturan yang sudah ditetapkan, kami mensortir ratusan kata (ekspresi awal) (lihat, Tabel 1). Kumpulan lkata-kata yang mereka ungkapkan ini disebut sebagai ekspresi eksplisit permukaan, dimana pada proses selanjutnya kita hendak mengungkap ekspresi implisit yang bersifat laten. 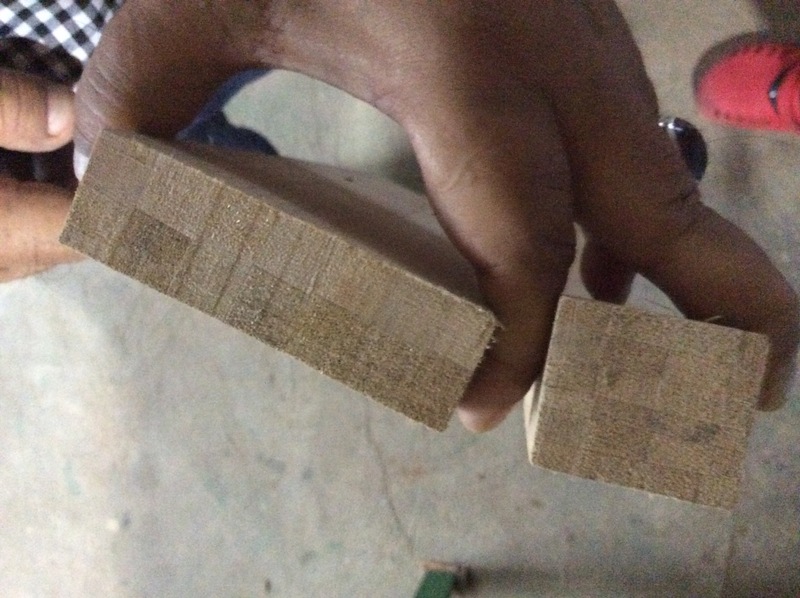 Craftsmen capacity, dimension, measure, standard, super, big, count, size, leg, height, thin, shape, square, position, part, head, stack, body, solid, base, width, top, long, oval, three-dimensional, thick, centimeter, box, design, container, fruit, duck, salt, egg, adjust, buyer, function, capable, form, set, color, supply, bamboo, scar, spot, glue, mark, sandpaper, etc. Designers place, kitchen, pluck, tree, shop, sensation, reap, pick, preservation, tropical, rotten, fresh, delicious, interaction, inform, remind, children, invite, accommodate, people, way, salad, commercial, habit, crowd, appeal, appreciate, attractive, dignity, snack, put, table, hang, fruit, wood, appear, stand, durian, banana, apple, orange, watermelon, grape, etc. Daftar kata ekspresi eksplisit tersebut kemudian di transfer dalam rumus vector graph dengan mengkalkulasi nilai bobot antara ekspresi eksplisit terhadap stimulusnya yakni ekspresi implisit dari kata tersebut (associative concept) degan system skor Out Degree Centrality (ODC). Sehingga, satu kata yang terucap dalam ekspresi dapat terkoneksi dengan kata-kata lain yang menjadi stimulus munculnya ekspresi eksplisit tersebut. Kata yang menjadi stimulus tersebutlah yang dikategorikan sebagai konsep-konsep asosiatif. Kata-kata konsep asosiatif yang tersusun dalam bentuk struktur jaringan konseptual tervisualisasikan dalam bentuk koneksi antar ribuan node. Untuk dapat memahami struktur kerumitan jaringan konsep asosiatif dalam model mental, maka kami melakukan metode reduksi sehingga didapatkan struktur jaringan konsep asosiatif yang lebih mudah difahami (lihat, Gambar 5a & 5b). Jelas terlihat, konsep asosiatif pengrajin ketika berimajinasi tentang desain wadah buah, asosiasi mendalamnya ada pada area dengan kategori ‘Shape’ seperti panjang, dada, sudut, badan. Selain itu juga ada pada area dengan kategori ‘Operation’ seperti mengurangi, melekatkan, dls. Sementara, konsep asosiatif bagi desainer ketika berimajinasi tentang wadah buah, terkategori dalam ‘Scene’ seperti konsep natur, kebiasaan, adat istiadat. Termasuk kategori ‘Appeal’ seperti juice, gaya, manner, dls. (Scene) silverware, tupperware, basket, bowl, tray, dishes, norm, public, booth, etc. etc. (Appeal) fresh, mint, cooked, rotten, food, raw, protein, dish, carrot, set, apple, etc. (Operation) replace, bond, reduce,, process, elaborate, produce, break, clean, etc. (Shape) shape, body, curve, waist, length, big, long, part, smal, etc. mempersempit cara pandang kepada hal-hal yang dalam jangkaunnya (operasi dan bentuk). Hal ini terjadi karena mereka terkait erat dengan penampilan fisik artefak dan prosesnya, seperti yang ditunjukkan oleh kata-kata stimulus. Sedangkan bagi desainer, pendekatan imajinatif nya mengungkapkan perspektif yang lebih luas, yakni asosiasi kepada faktor terkait ‘Scene’ dan ‘Appeal’ (lihat, Gambar 6). Untuk menegaskan peran dan pengaruh dari konsep asosiatif dalam proses kreatif, maka langkah berikutnya adalah menganalisisnya dalam bentuk peta relasi semantik. Dengan mengaplikasikan seluruh daftar karakteristik asosiatif tersebut akan dapat divisualkan tendensi cara pandang dan pengelompokannya. Peta semantik dihitung melalui Analisis Faktor yang menampilkan tendensi cara pandang berdasar kelompok sifat dan jenis kata melalui pemetaan orthogonal. Dalam hal ini, tingkat konsep asosiatif dari para pengrajin cenderung berada pada faktor yang terkait dengan ‘Operation’ dan ‘Shape’. Sedangkan konsep asosiatif desainer secara signifikan berada pada faktor-faktor terkait lingkungan yakni ‘Scene’ dan ‘Apeal’. Hal ini sekaligus menunjukkan tingkat kognitif pengrajin selama pendekatan imajinatif cenderung untuk mempersempit cara pandang kepada hal-hal yang dalam jangkaunnya (operasi dan bentuk). Hal ini terjadi karena mereka terkait erat dengan penampilan fisik artefak dan prosesnya, seperti yang ditunjukkan oleh kata-kata stimulus. Sedangkan bagi desainer, pendekatan imajinatif nya mengungkapkan perspektif yang lebih luas, yakni asosiasi kepada faktor terkait ‘Scene’ dan ‘Appeal’ (lihat, Gambar 6). Sebagaimana ditampilkan melalui struktur jaringan konsep asosiatif dan peta semantic menggunakan Analisis Faktor bahwa semakin tinggi kandungan asosiatif dari kata yang diucapkan berkorespondensi dengan asosiasi yang luas atau berpikir lebih abstrak. Kami menemukan bahwa desainer lebih sering menggunakan kata-kata yang mengandung banyak asosiasi atau polisemi. Demikian sebaliknya dengan pengrajin, mereka terjebak dalam cara pandang yang familiar dimana menutup kemungkinan untuk berpikir lebih luas. Contohnya kata-kata yang mereka ungkapkan menghasilkan kata asosiatif yang sedikit mengandung polisemi. Hal ini bermakna, jangkauan imajinasi pengrajin dalam membayangkan wadah buah tetap tak bisa terlepas dari sifat fisik dan sistem operasi mengolah artefak tersebut. Bila kita mengkaitkannya dengan teori Associative Gradient Theory, maka kemampuan berpikir dengan asosiatif yang rendah (sedikit metaforik) mengarah pada representasi berpikir stereotype yang akan mengurangi kreativitas [14, 15]. Studi lain menyebutkan bahwa polisemi dalam desain dapat berkolerasi dengan orisinalitas. Oleh karenanya kami meyakin bahwa kemampuan desainer dalam menjangkau konsep asosiatif yang kaya telah berhasil mengarahkannya mengakses potensi kreatif dalam berkarya. Kemampuan desainer berpikir secara lebih abstrak yang dibuktikan dengan ekspresi verbal banyak yang mengandung konsep asosiatif menjelaskan pembayangan mental yang potensial mengakses kreatifitas. Sedangkan pengrajin sendiri mengalami hambatan untuk dapat mengakses konseptualisasi kreatif seperti desainer. Upaya menyiasati hambatan konseptualisasi kreatif pengrajin telah dilakukan dengan memodifikasi tahapan konseptualisasi secara bertahap . Metode yang digunakan dalam mengefektifkan program pelatihan desain bagi pengrajin adalah membaginya menjadi dua tahapan. Tahapan pertama, pengrajin justeru didorong memaksimalkan cara pandang konservatifnya semaksimal mungkin. Selanjutnya, hasilnya dievaluasi oleh pengrajin sendiri untuk memperoleh kata-kata kunci representasi dari produknya. Pada tahapan kedua pelatihan desain, kata-kata kunci digunakan sebagai stimulasi untuk mengembangkan produk. Pada tahapan ini, metode pelatihan desain ini membuka peluang memanfaatkan stimulant berupa kata-kata tersebut untuk di terapkan dalam wujud produk. Proses ini mengadopsi cara konseptualisasi desainer yang berpikiran lebih abstrak dan kaya akan asosiasi. Dalam proses ini pengrajin dikondisikan melepas dari familiarisasi yang sering mereka terapkan, stimulan kata tersebut menghasilkan asosiasi kata yang luas, sehingga mereka akan merasakan canggung, ketidaknyamanan dalam defamiliarisasi. 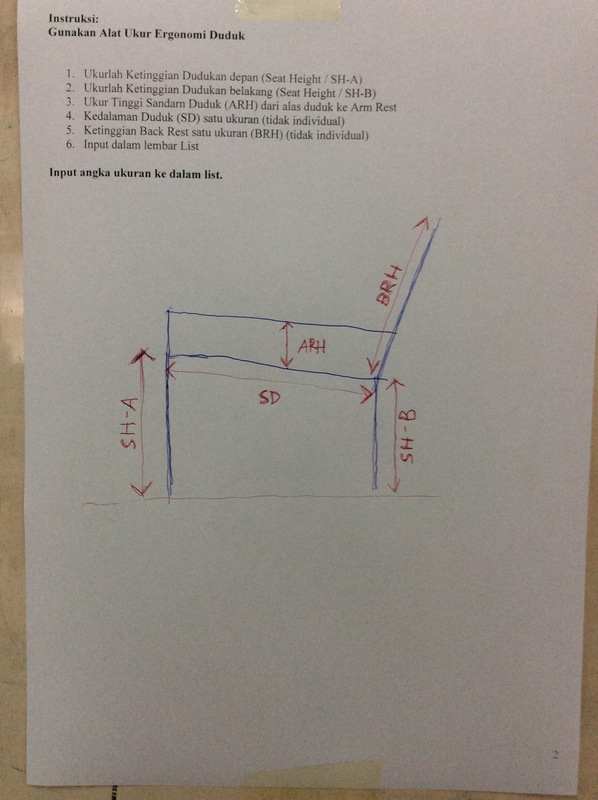 Dalam metode yang diperkenalkan ini pengrajin mampu melepaskan diri dari fiksasi konsep yang familiar, termasuk aspek tangible atau teknis (yaitu operasi, bentuk, dan proporsi). Berikut adalah, penerapan metode terkini pelatihan desain yang disesuaikan dengan kemampuan kognitif pengrajin yang telah diterapkan dalam pelatihan desain dan pengembangan produk kelom geulis di Tasikmalaya. Pengrajin kelom geulis didorong untuk mengembangkan desain kelom geulis sesuai ide mereka tanpa ada upaya merubah atau mengarahkan desain sesuai teori prinsip dan lemen visual. Hasilnya adalah berbagai desain kelom yang rumit dan ekstrim dekoratif. Pengrajin diberikan pemahaman bahwa seluruh karya yang mereka hasilkan adalah hasil maksimal konseptualisai kreatif mereka. Pada tahap ini pula pengrajin diminta mengevaluasi desain tersebut, sehingga memunculkan kata-kata kunci seperti: “mudah patah”, “terbalik”, “pecah”. Berbagai kata terpilih tersebut kemudian dipilih sebagai stimulant dalam mendesain kelom di tahap kedua. Pada tahap ini, pengrajin mengalami rasa canggung, dan tidak nyaman ketika haru megembangkan produk dengan kata kunci “mudah patah”, “terbalik”, “pecah”. Kata-kata yang mereka anggap tidak familiar tersebut representasi dari hasil konseptualisasi pada tahap pertama yang mereka hasilkan sendiri. Selanjutnya mereka berhasil mengembangkan kelom dari kata “hak terbalik” yang justeru mereka akui memiliki keunikan. Sukses dalam penerapan pengembangan metode pelatihan desain bagi pengrajin dengan sudut pandang konservatif membuktikan bahwa pengrajin yang biasanya konsisten dengan nilai-nilai komunal dan konvensional tetap dapat dikembangkan. Temuan ini bermanfaat sebagai referensi pedagogi dalam program pendidikan pelatihan desain yang bertujuan untuk meningkatkan kognisi kreatif. Suzuki, N. 2005. Problems and development issues for artisan craft promotion: The effective promotion for regional development in developing countries: Part I, Bulletin of JSSD, Vol. 52 No. 2. Nagai, Y., Junaidy, D.W., and Ihsan, M. 2012. 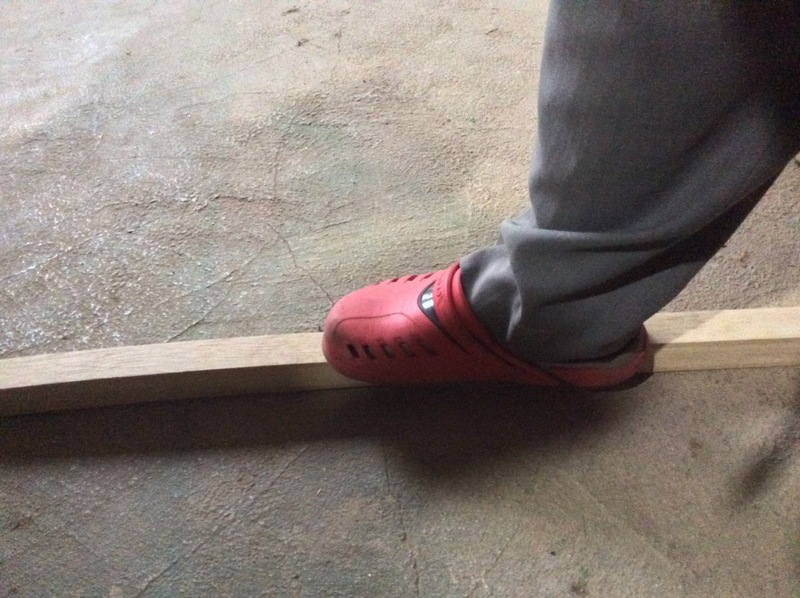 A creativity gap in design training: A case study of pre and post-design and creativity training for wooden sandal craftsmen in Tasikmalaya, Indonesia. The 59th Annual Conference of JSSD, Sapporo, June 22-24, 2012. Viswanathan, V., & Linsey, J. 2012. A study on the role of expertise in design fixation and its mitigation. In ASME 2012 International Design Engineering Technical Conferences and Computers and Information in Engineering Conference (pp. 901-911). American Society of Mechanical Engineers. Georgiev, G. V. and Nagai, Y. 2011. A conceptual network analysis of user impressions and meanings of product materials in design, Materials and Design, Vol. 32 No. 8-9, pp. 4230-42. Nagai, Y, Georgiev, G. V. and Zhou, Feng. 2011. A methodology to analyze in-depth impressions of design on the basis of concept networks’, Journal of Design Research, Vol. 9 No. 1, pp. 44-64. Taura, T., Yamamoto, E., Fasiha, M. Y. N., & Nagai, Y. 2011. Virtual impression networks for capturing deep impressions, Design Computing and Cognition DCC’10’, in Gero, J.S. (Ed.). Springer, pp. 559-578. Goldschmidt, G. D, and Tatsa. D, 2005. How good are good idea? 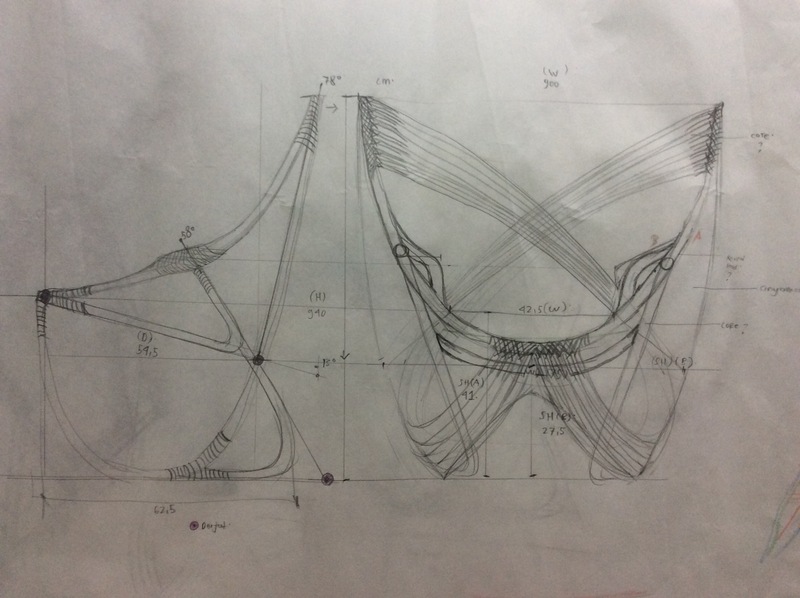 Correlates of design creativity, Design Studies, No. 26, pp. 593-611. Lugt, R van de. How sketching can affect the idea generation process in design group meetings, Design Studies, 26, pp. 101-122. Yamamoto, E., Mukai, F., Fasiha, M. Y. N., Taura, T., & Nagai, Y. 2009. A method to generate and evaluate creative design idea by focusing on associative process, Proceedings of the ASME2009. California, USA. Ericsson, K. A, and Simon, H. A. 1993. Protocol Analysis: Verbal Reports as Data, MIT Press, Cambridge, MA. Mwihaki, Alice, 2004. Meaning as use: A functional view of semantics and pragmatics, Swahili Forum, No. 11, pp. 127-139. Nelson, D. L, McEvoy, C.L and Schreiber, T. 2004. The university of south florida free association, rhyme, and word fragment norms, Behavior Research Methods, Instruments and Computers, Vol. 36 No. 3, pp. 402-407. Maki, W.S, and Buchanan, E. 2008. Latent structure in measures of associative, semantic and thematic knowledge, Psychon Bull Rev, Vol. 15 No. 3, pp. 598–603. Eysenck, H. J. 1997. Creativity and personality, in Runco, Mark A. (Ed. ), Creativity Research Handbook, Hampton Press, Cresskill, NJ, No. 1, pp. 41-66. Martindale, C. 1995. 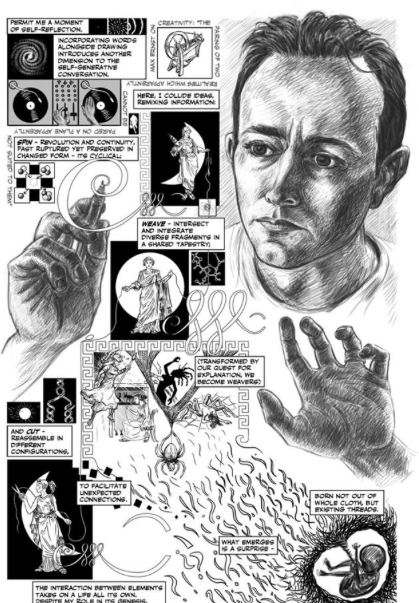 Creativity and connectionism, in Steven, S. M, Ward, T. B. and Finke, R. F (Eds.). 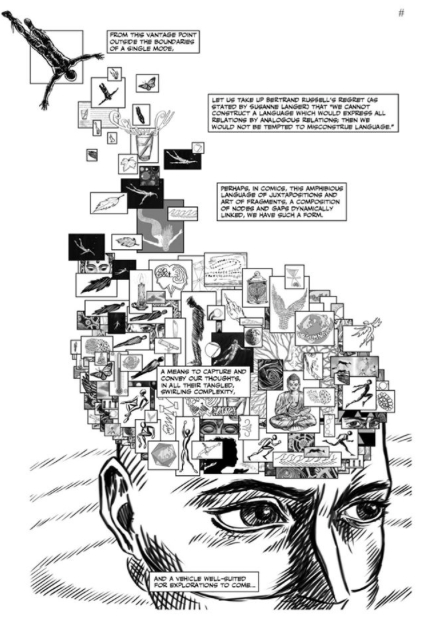 The Creative Cognition Approach, The MIT Press, Cambridge, MA, pp. 249-268. 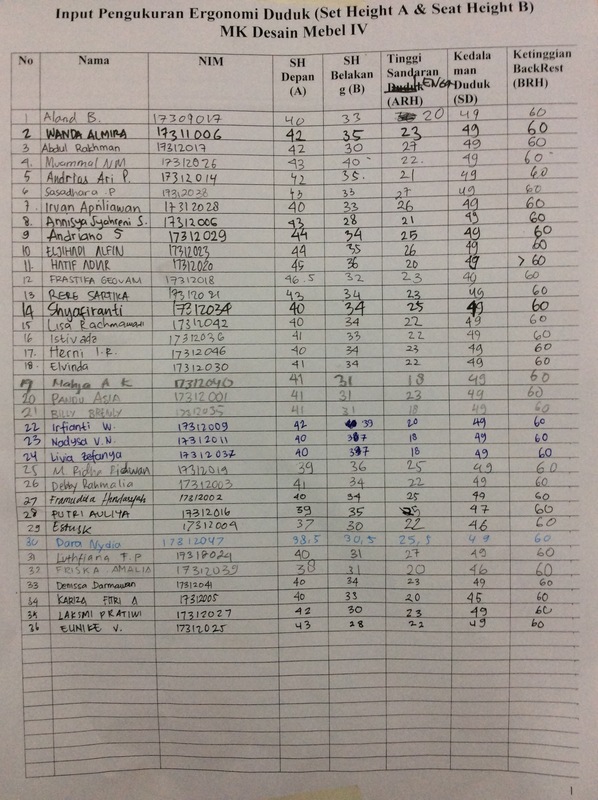 Junaidy, Deny W., Nagai, Y., Ihsan, M. 2012. Capturing Craftsmen’s and Designers’ Associative Concept at In-depth Level of Cognition at the Early Stage of Idea Generation, Proceeding of Design Symposium 2012, pp. 245-249, Kyoto, Japan, 16-17 October. Menulis Thesis atau Menggambar Thesis? Nick Sousanis memperoleh gelar Doctor of Education (EdD) di Columbia University Teacher’s College tahun 2014 dengan disertasi berformat komik! 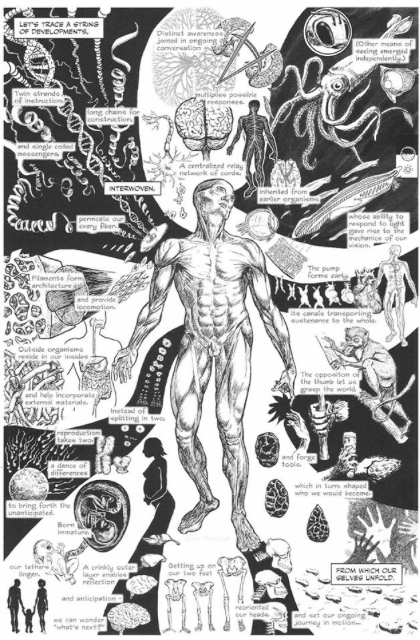 Disertasinya berjudul UNFLATTENING (Menyembul) adalah eksperimen berpikir visual (visual thinking) menentang bentuk konvensional wacana ilmiah. Sousani mengevaluasi pakem diskursus akademik yang selalu berkutat pada pencapaian berbasis ‘TEKS,’ sedangkan ‘GAMBAR’ selalu dianggap informasi sekunder, pelengkap dan sisipan. 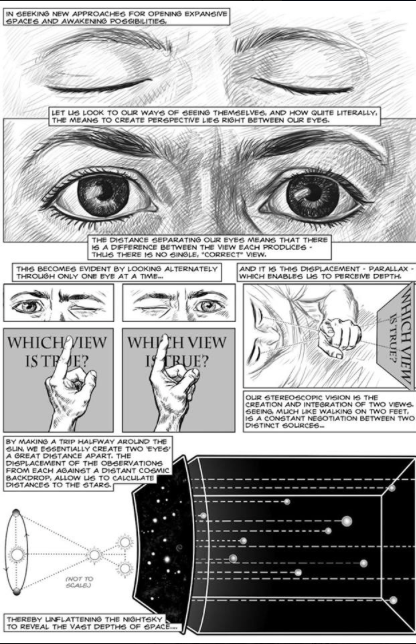 ‘Unflattening’ adalah argumentasi tentang kelemahan dimensi tekstual konvensional bila dibandingkan dimensi visual. 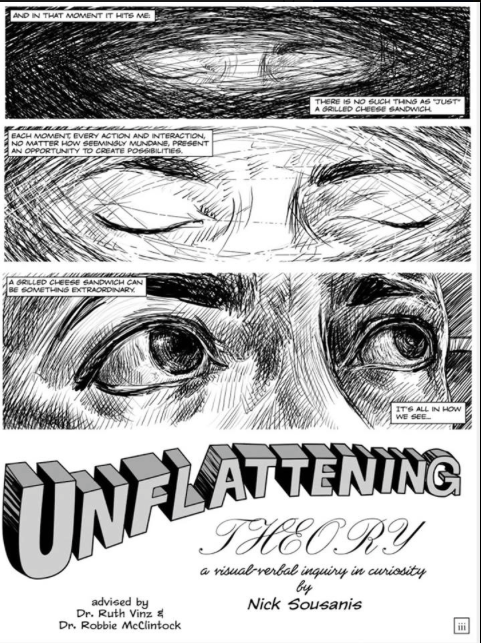 ‘Unflattening’ mengajarkan kita bagaimana mengakses mode pemahaman diluar kebiasaan. Ia mengilustrasikan cara berpikir visual ala Al Tusi hingga Copernicus yang telah memperluas imajinasi mereka sehingga mampu memahami sistem tata surya. Cara berpikir visual tersebut Sousanis ilustrasikan dengan seseorang yang melakukan observasi di antariksa terhadap orbit bumi mengelilingi matahari. Dibutuhkan “dua mata” untuk memahami jarak antar bintang, ‘satu mata’ dengan persepsi di bumi, dan ‘satu mata’ lainnya ketika berada dalam gerak di antariksa. Saya sendiri belum terbayang paper-nya di Journal of Curriculum and Pedagogy, tetapi disertasinya masuk dalam pameran penelitian di Microsoft Research di Seattle. Disertasinya diterbitkan menjadi buku oleh Harvard University Press. Disertasinya hingga saat ini masih menjadi perbincangan dan perdebatan hangat di grup diskusi para peneliti desain. Gambar dibawah adalah beberapa lembar isi disertasi Sousanis. Mitos populer adanya individu dgn dominasi otak kiri atau otak kanan diawali tahun 1861. Seorang pasien yang berkurang kemampuan berkomunikasinya diketahui mengalami kerusakan otak di bagian hemisfer kiri. Selanjutnya, tahun 1960 ada eksperimen dengan subyek epilepsi, dimana subyek tsb sulit mengkomunikasikan ‘stimulasi gambar’ yg dilihatnya di layar sebelah kiri, sedangkan ‘stimulasi kata-kata’ disebelah kiri mudah ia komunikasikan dan demikian sebaliknya. Eksperimen ini menjelaskan bahwa otak kiri berkorelasi dengan bahasa dan otak kanan berkorelasi dengan kemampuan visual. Puluhan tahun berikutnya hasil eksperimen ini menjadi budaya populer: individu kreatif adalah otak kanan, individu logis dan sistematik adalah otak kiri. Sejak 1980an teknologi brain imaging semakin berkembang dan telah berlimpah tulisan ilmiah yang meluruskan teori hemisper kanan-kiri. Para neuroscientist memastikan bahwa BELUM ADA BUKTI adanya peran dominasi otak kanan atau kiri. Yang masih berlaku adalah, otak kanan mengontrol bagian tubuh kiri dan sebaliknya. Neuroscientist menegaskan, otak demikian saling melengkapi dan tidak sepenuhnya lateral, contoh: ketika otak kiri memproses grammar dan pronunciation, maka otak kanan memproses intonasi. Toshiharu Taura ==> Virtual Impression Networks for Capturing Deep Impression.